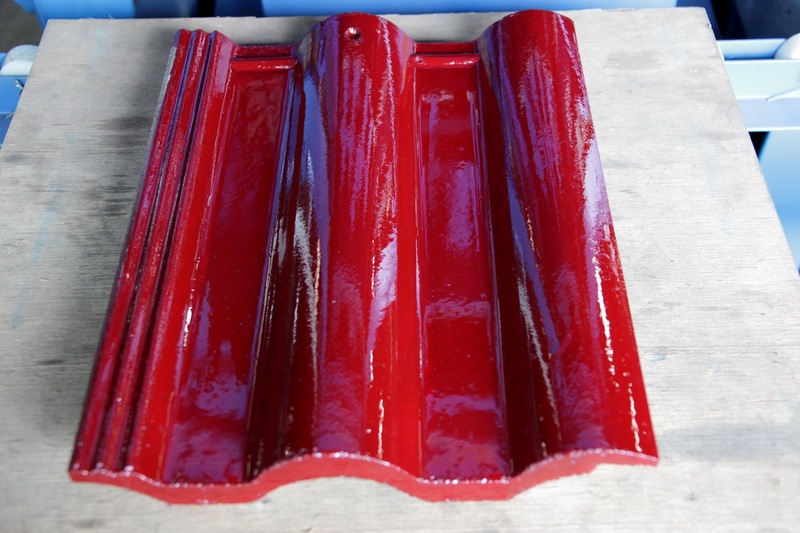 BASICLY , ROOF PAINT OR ANY OTHER PAINT IS JUST MADE FROM A BASIC SIMPLE MATERIALS . 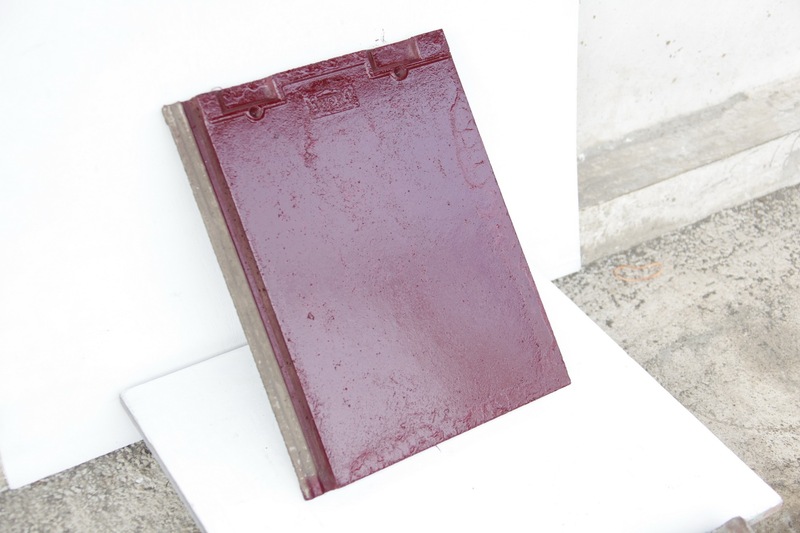 THE MATERIALS ARE JUST : LATEX AND COLOR PIGMENTS . 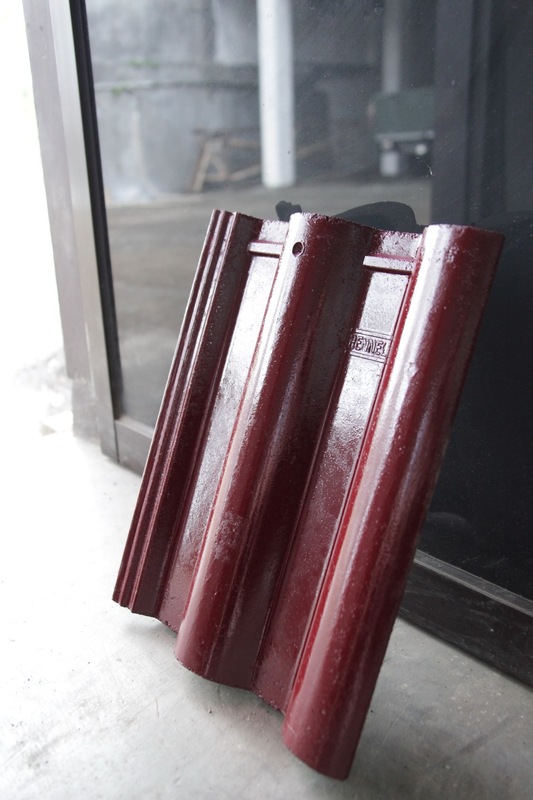 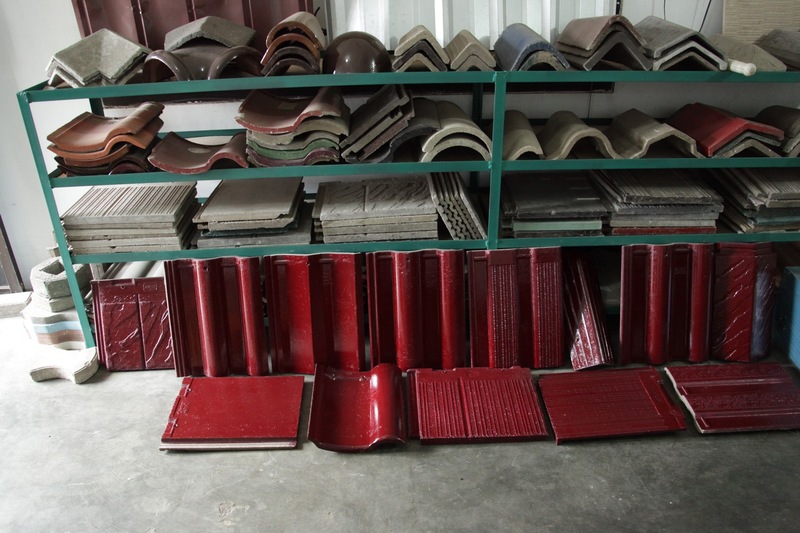 THERE ARE 2 KINDS OF LATEX , THE WATER BASE LATEX AND OIL BASE LATEX . 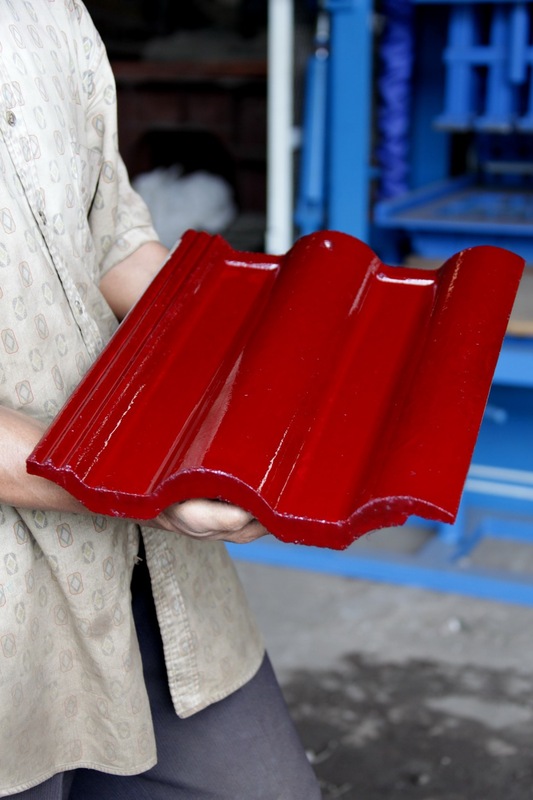 IF YOU USE THE OIL BASE LATEX THEN YOU MUST USE THINNER FOR THE SOLUTION , AND IF YOU USE THE WATER BASE LATEX THEN YOU MUST USE WATER FOR THE SOLUTION . 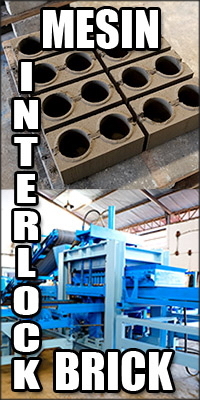 ( REMEMBER THAT OIL NEVER CAN MIX WITH WATER ) . 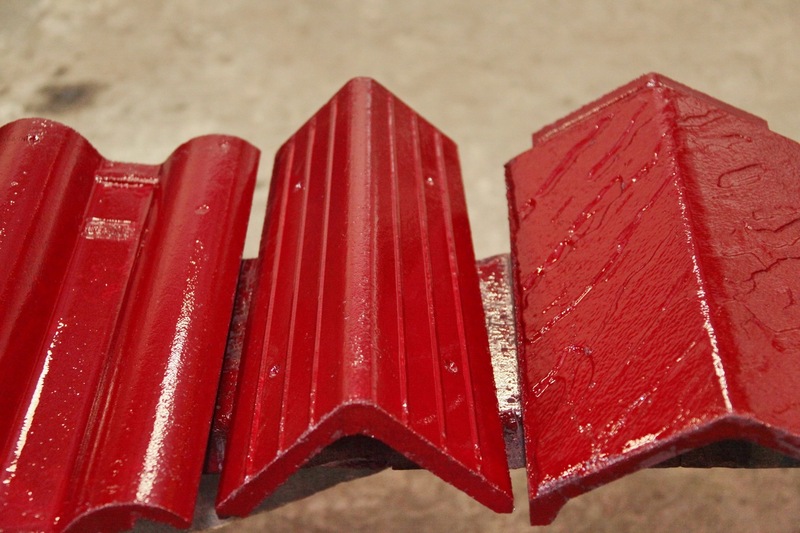 FOR WATER BASE : USE THE WATER BASE LATEX , MIX WITH COLOR PIGMENTS . 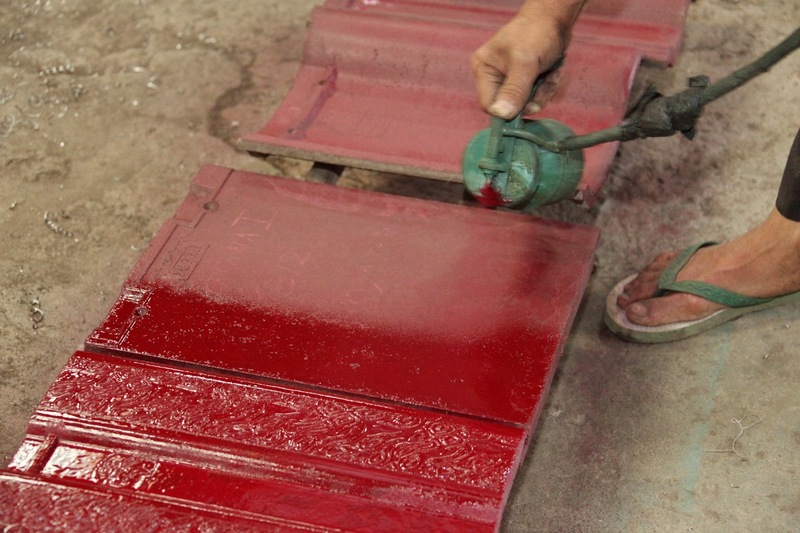 THEN MIX THEM WITH WATER TO PAINT THE ROOF TILES . 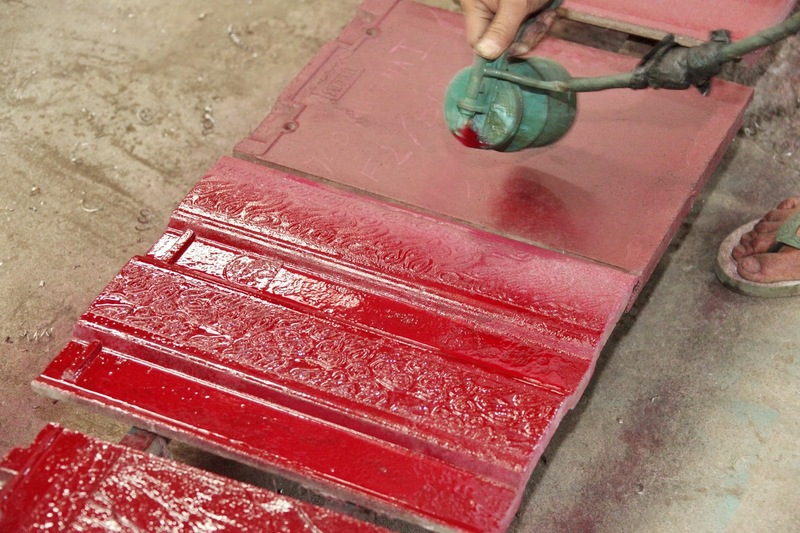 FOR OIL BASE : USE THE OIL BASE LATEX , MIX WITH COLOR PIGMENTS . 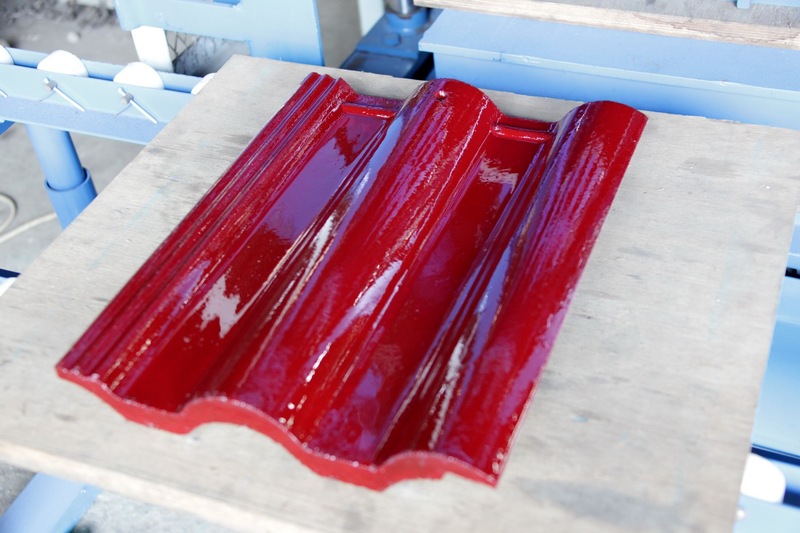 THEN MIX THEM WITH THINNER GRADE A , TO PAINT THE ROOF TILES . 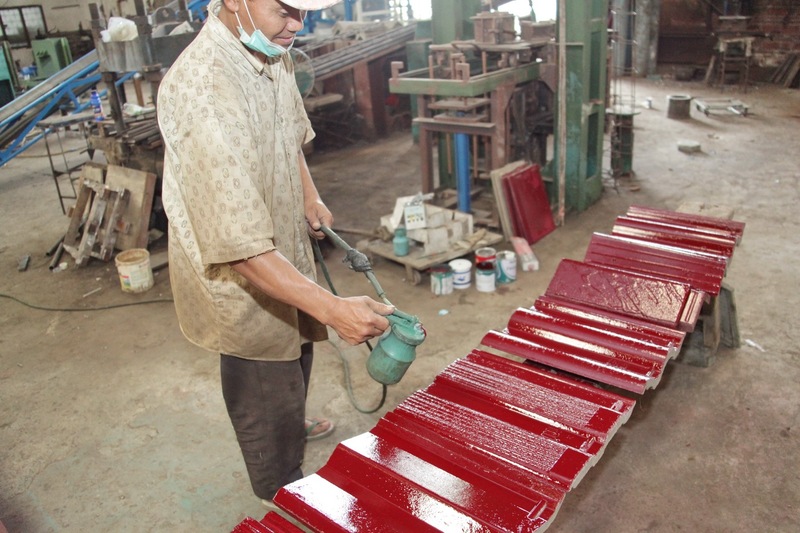 MAKING THE COLOR : IS JUST THE MATTER OF MIXING THE COLOR PIGMENTS , FOR EXAMPLE TO MAKE MAROON IS USING THE RED PIGMENT MIXED WITH BLUE PIGMENT IN THE CORRECT PERCENTAGES . 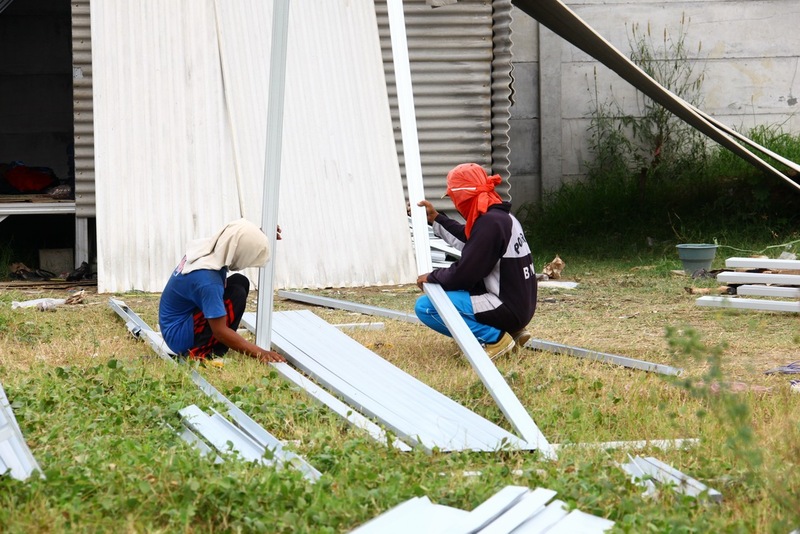 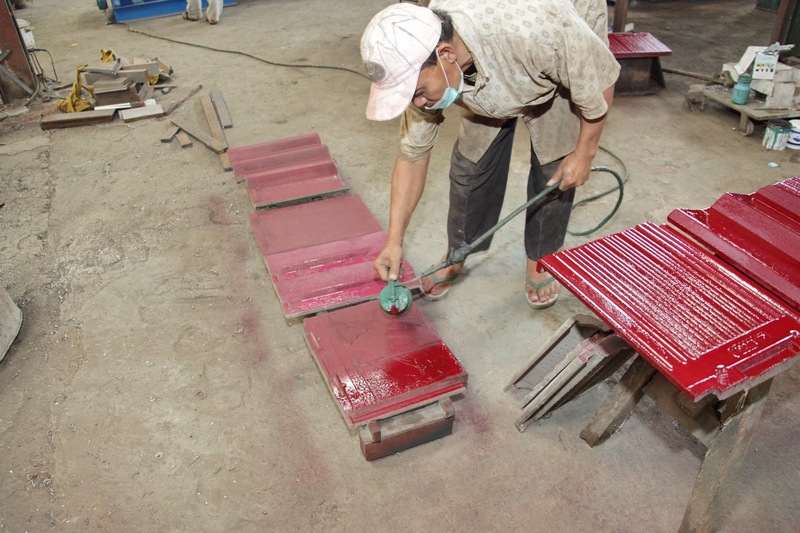 THEN , SOME PAINT FACTORIES ALSO PUT IN SOME CHEMICAL MATERIALS , FOR EXAMPLE : THE ANTI BACTERIA , ANTI UV , ETC . 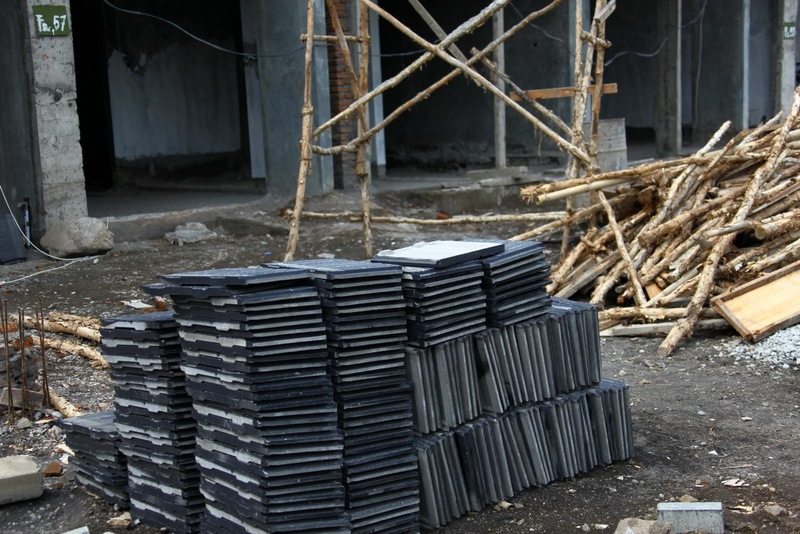 BUT WE DONT NEED ALL OF THEM . 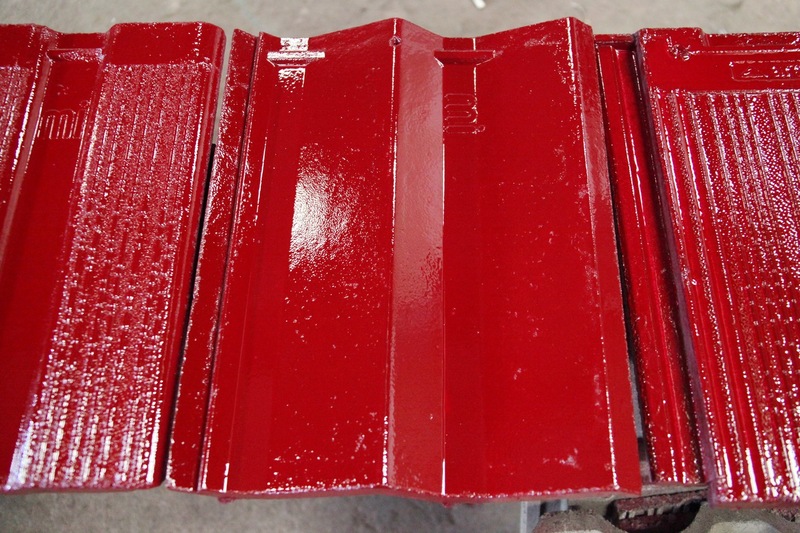 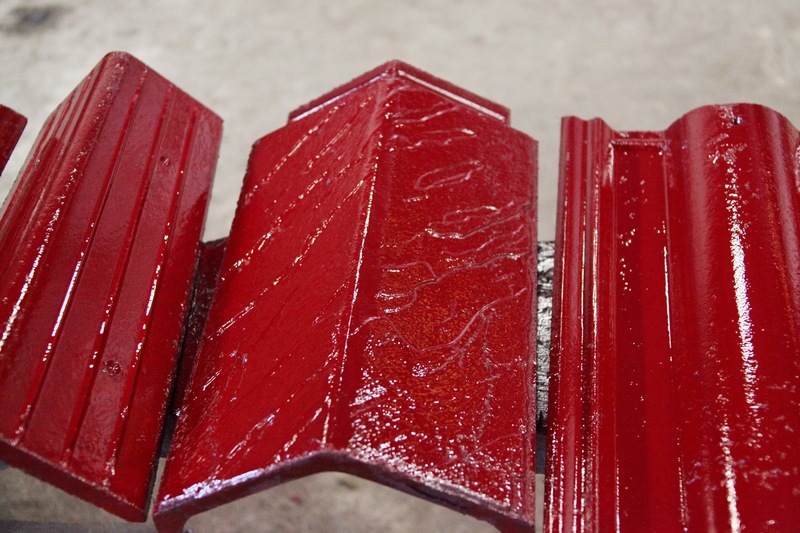 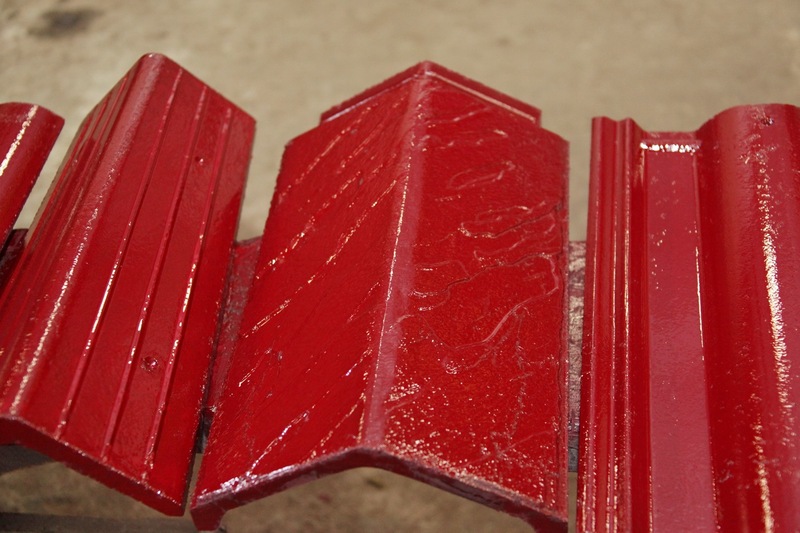 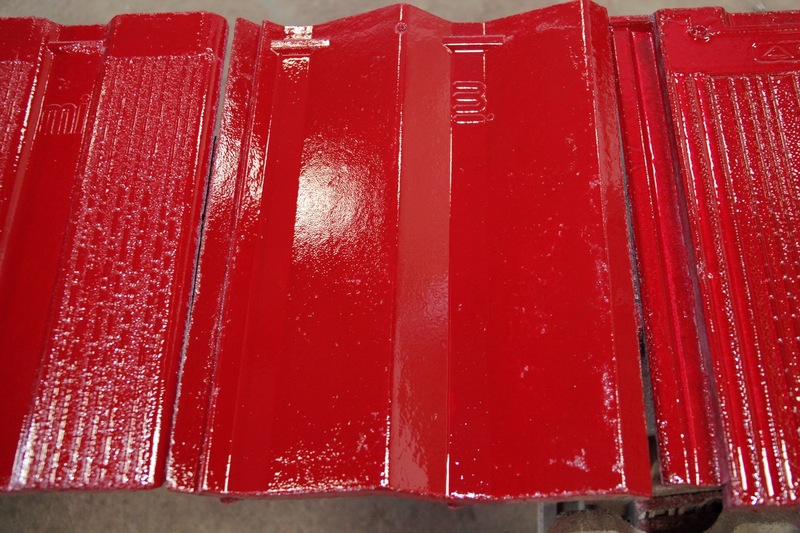 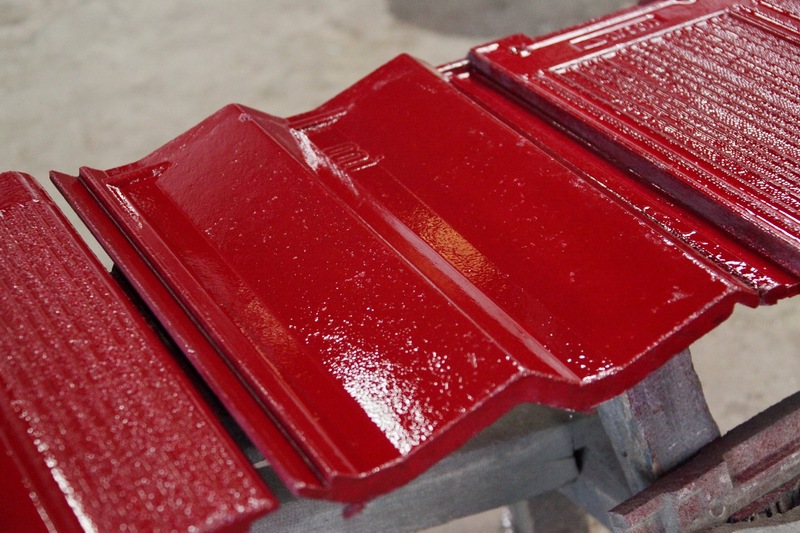 WE JUST WANT TO MAKE THE PAINT , AS CHEAPER AS WE CAN , WITH SIMILIAR QUALITY . 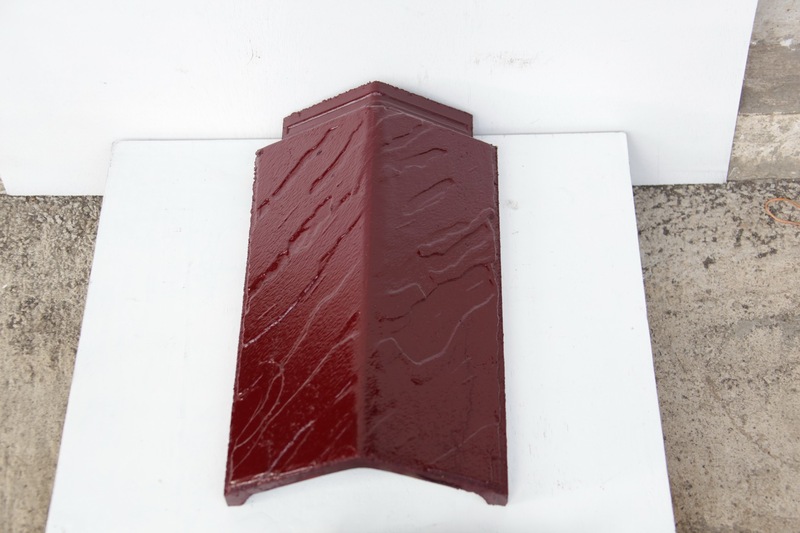 BUT , BETWEEN THE OIL BASE AND WATER BASE , THERE IS A GREAT SOLUTION TO USE THE NATROSOL , SO YOU CAN USE THE WATER BASE PAINT , MIX WITH NATROSOL , SO THE PAINT WILL LOOK SIMILIAR TO THE OIL BASE PAINT . 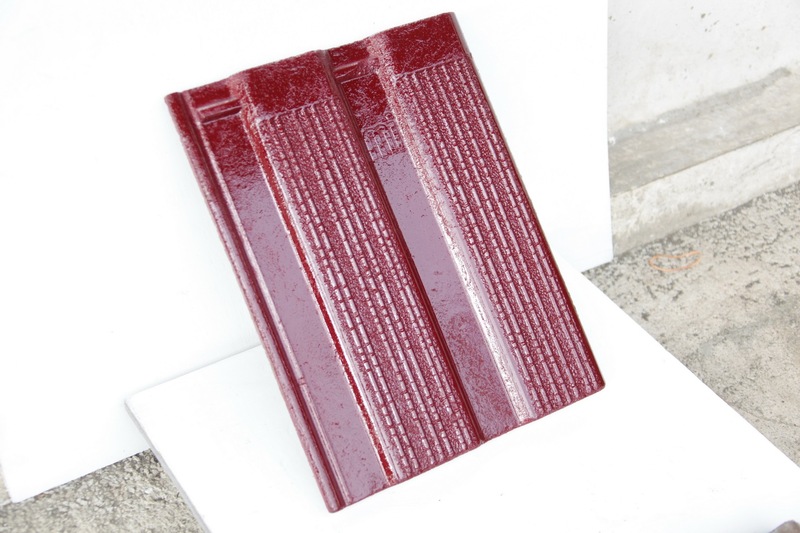 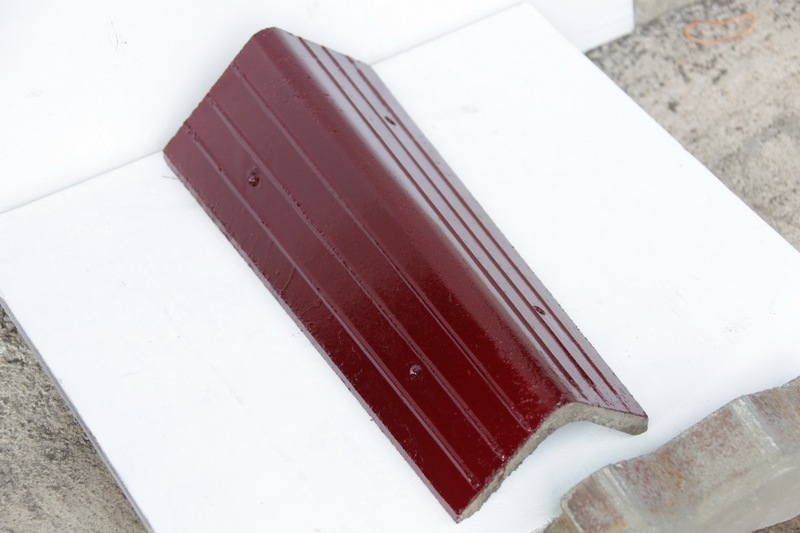 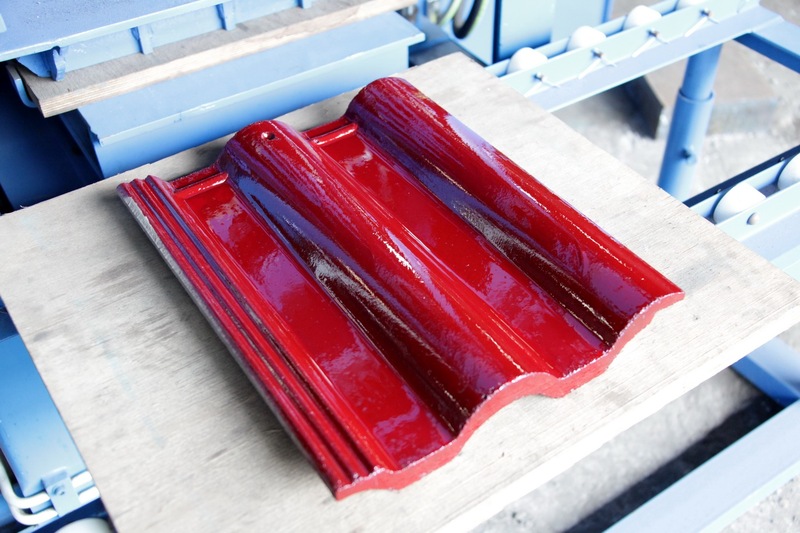 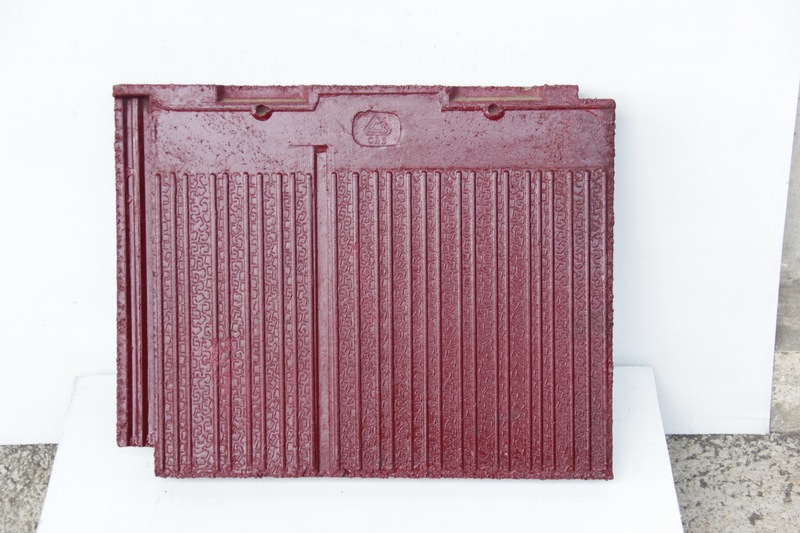 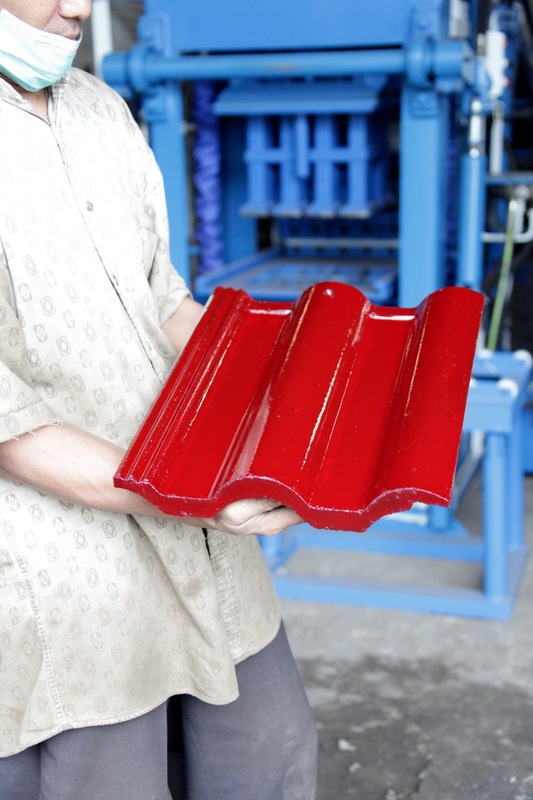 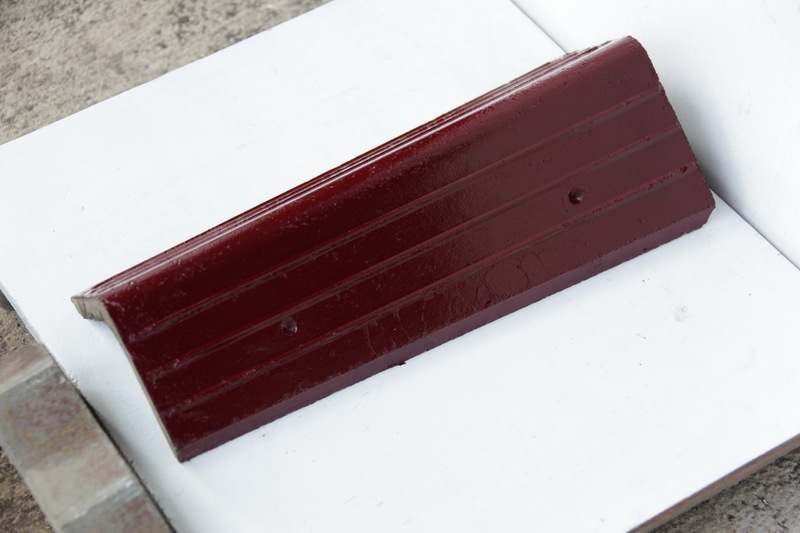 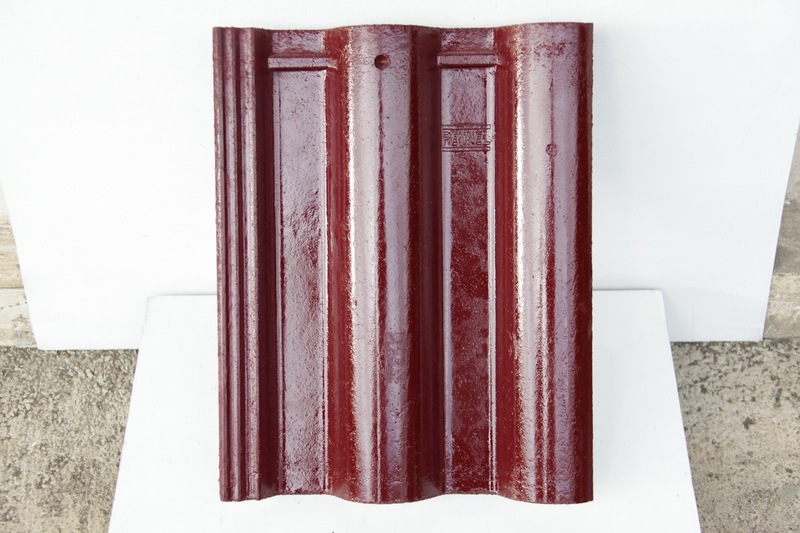 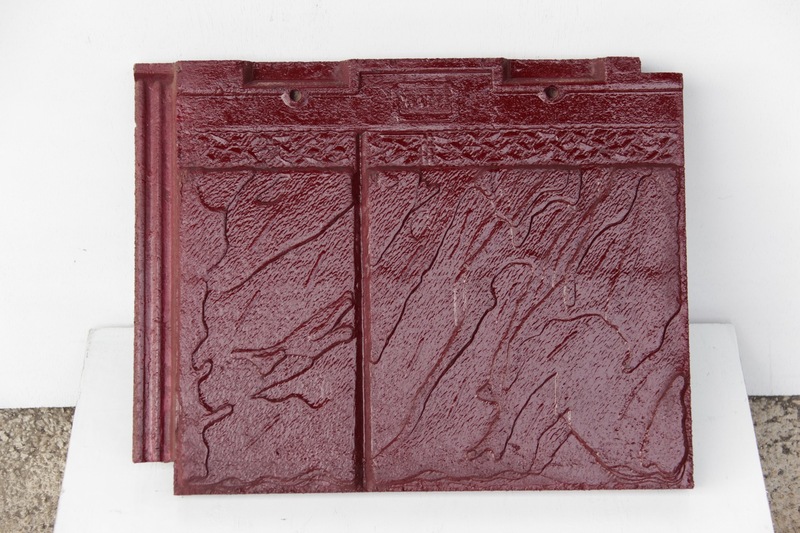 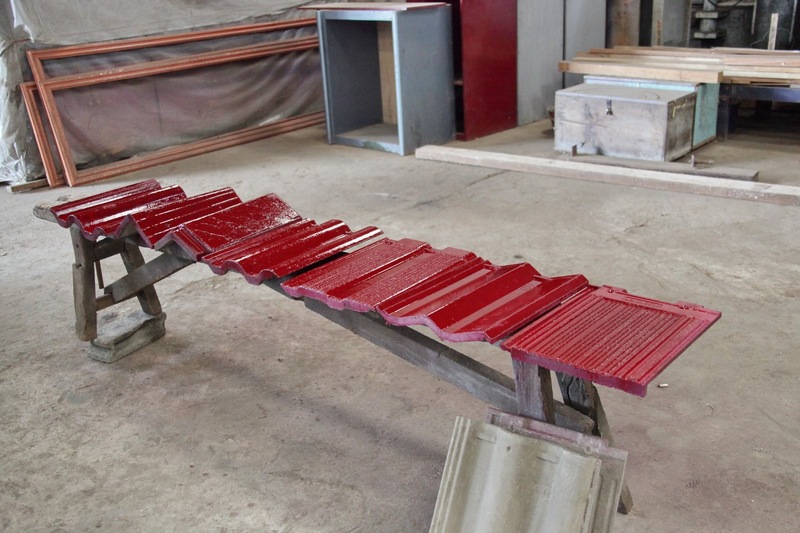 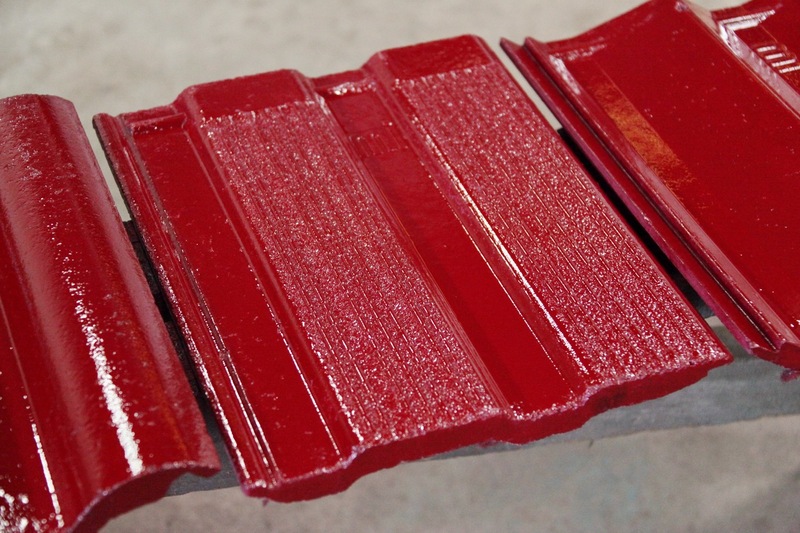 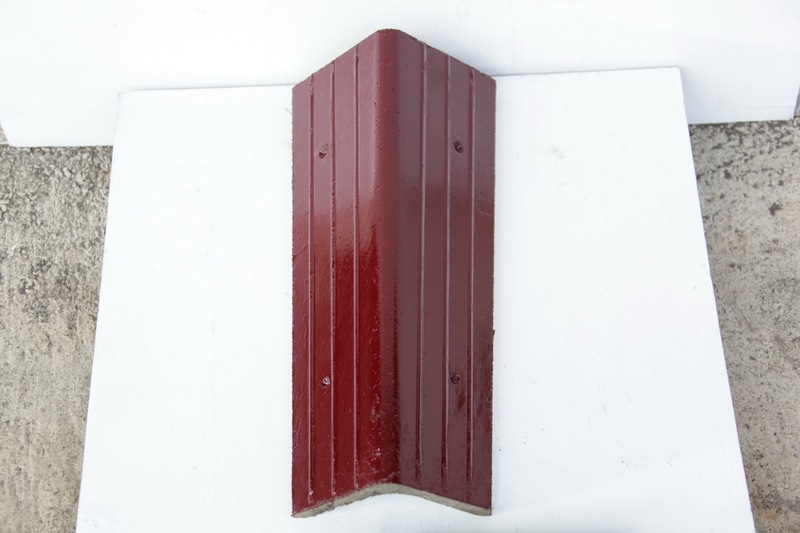 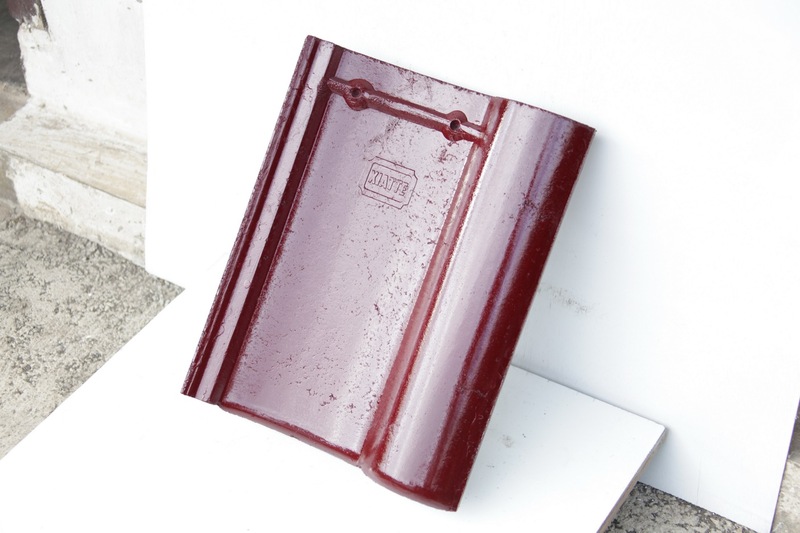 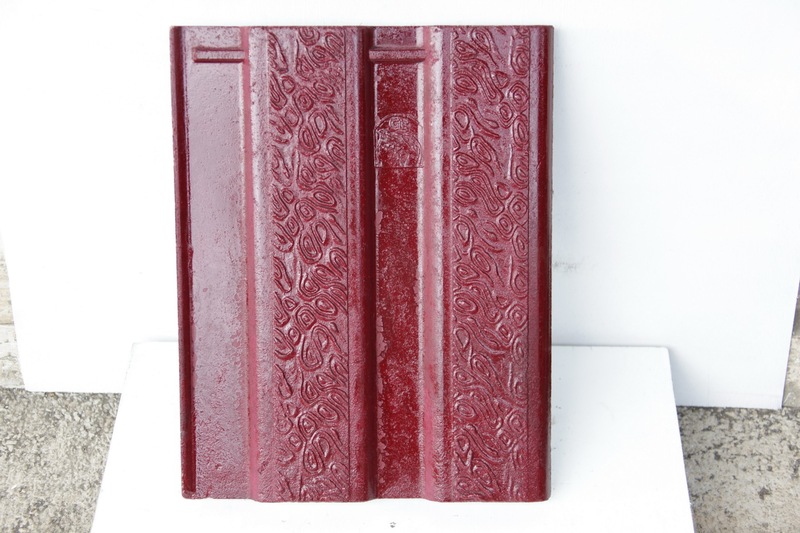 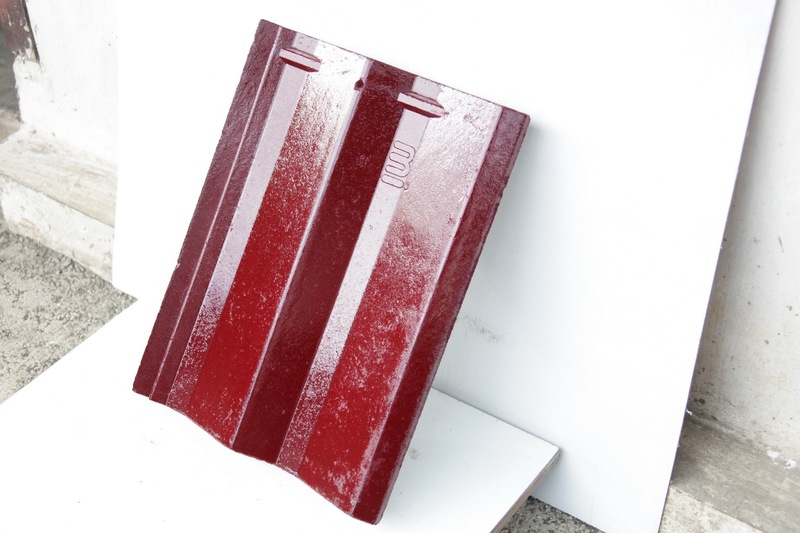 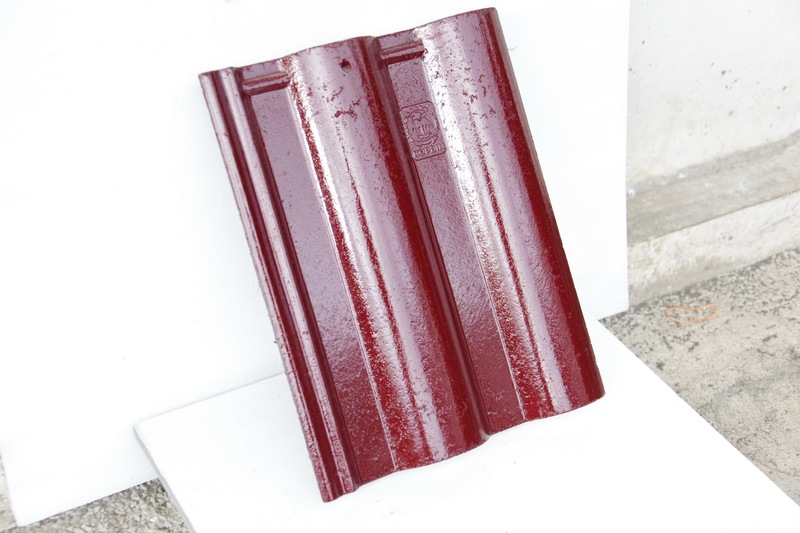 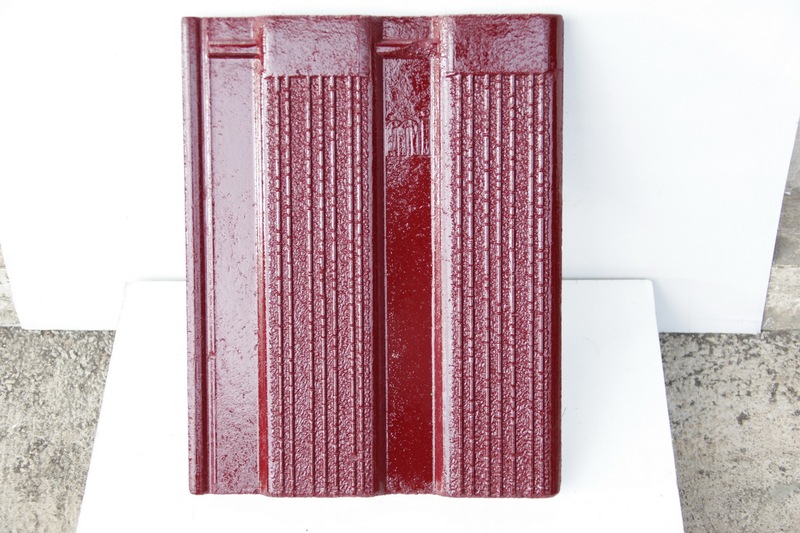 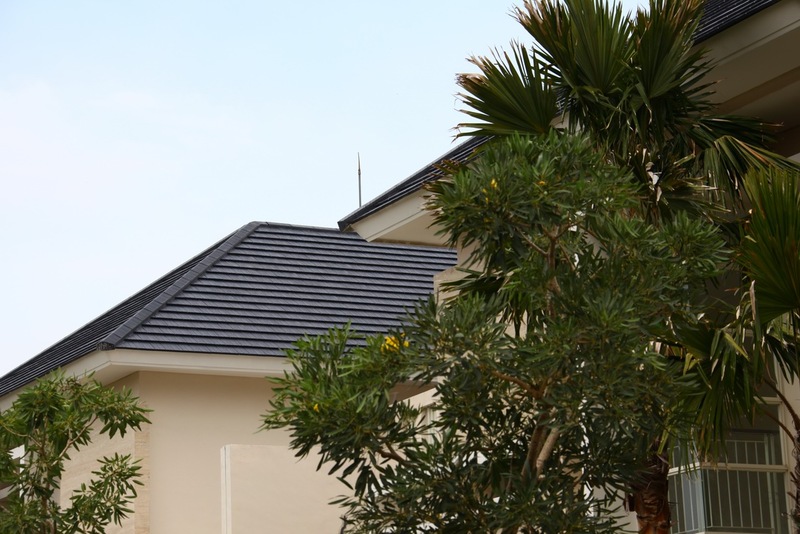 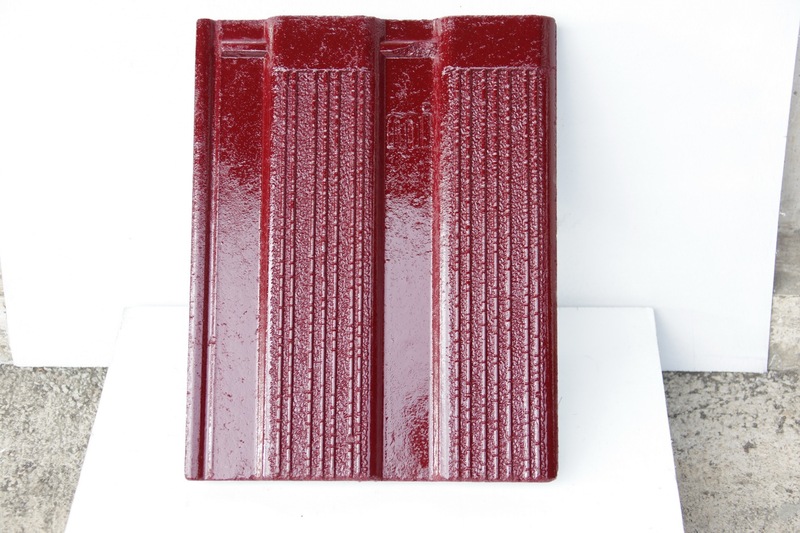 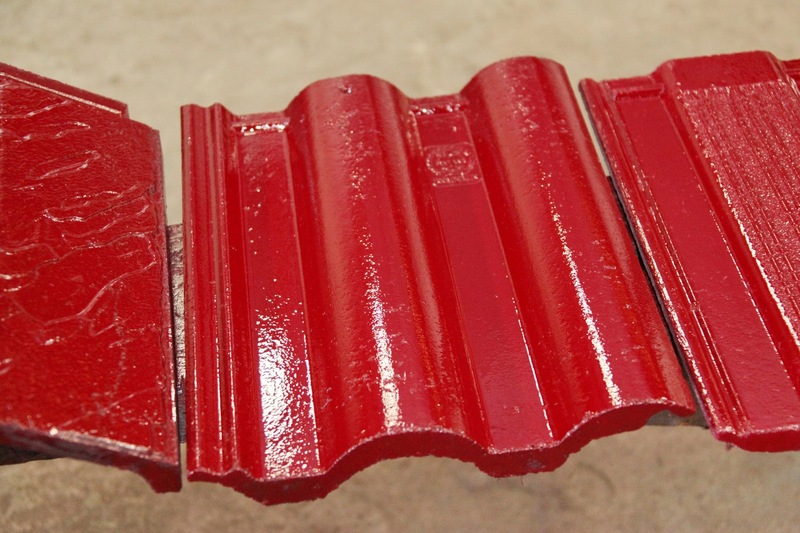 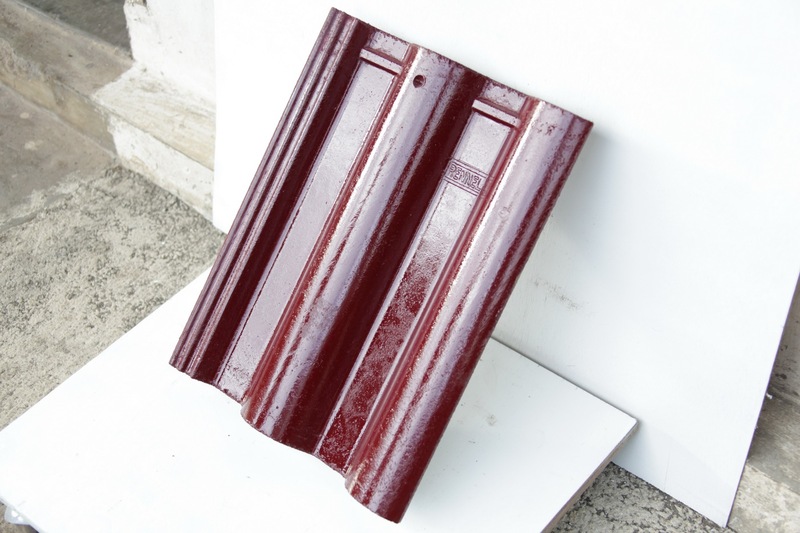 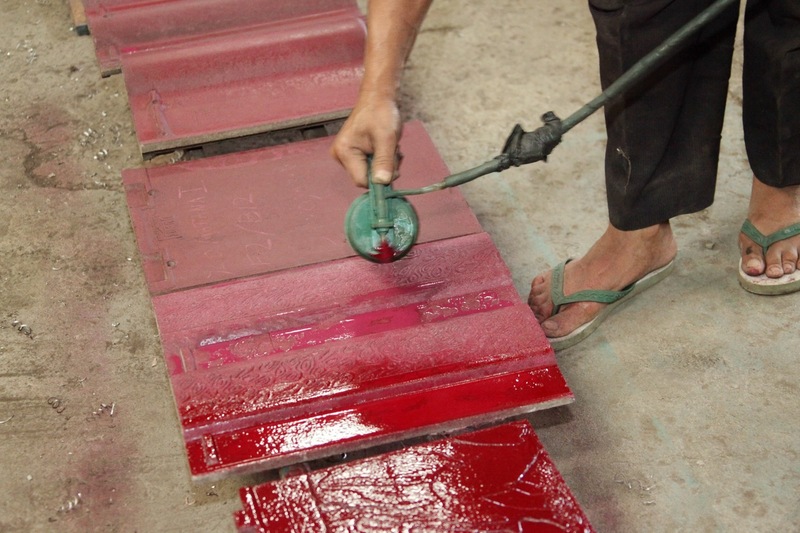 THIS IS A SECRET WAY TO PAINT THE ROOF TILES WITH CHEAPER COST . 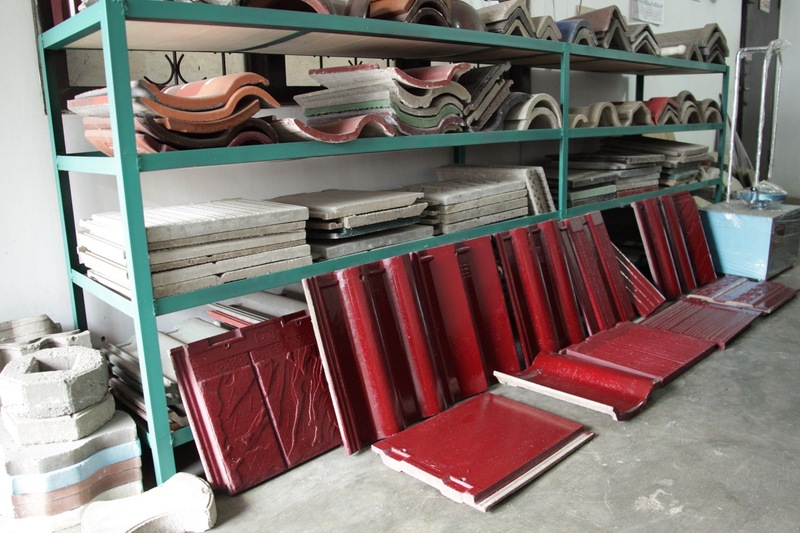 THERE ARE MANY BRAND OF LATEX , ALSO MANY BRAND OF COLOR PIGMENTS , AND ASLO MANY BRAND OF NATROSOL . 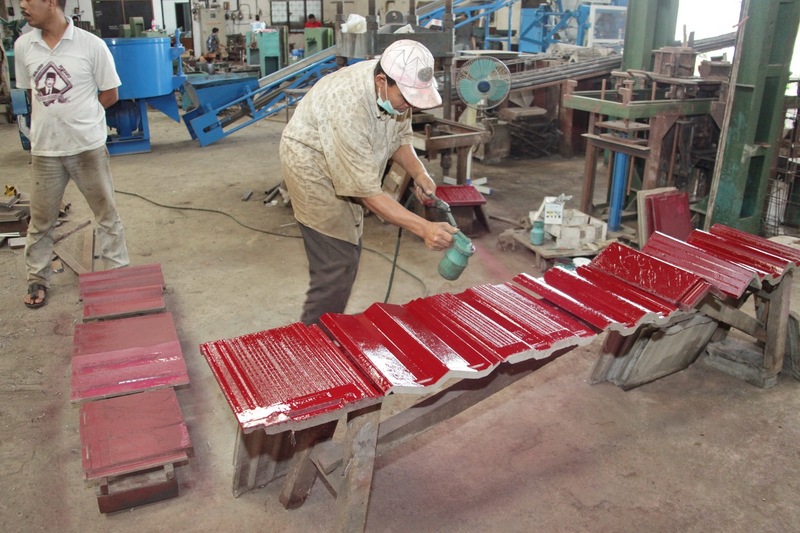 FOR EXAMPLE : BAYER COLOR , HOLLAND COLOR , ETC . 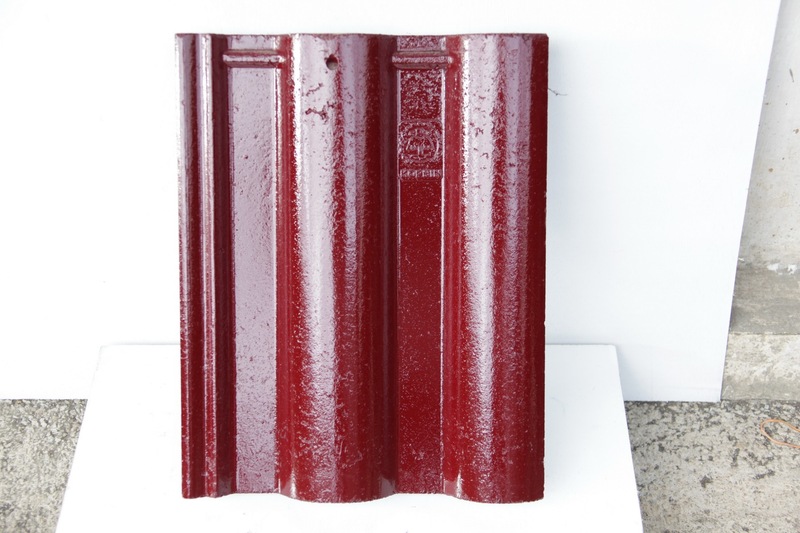 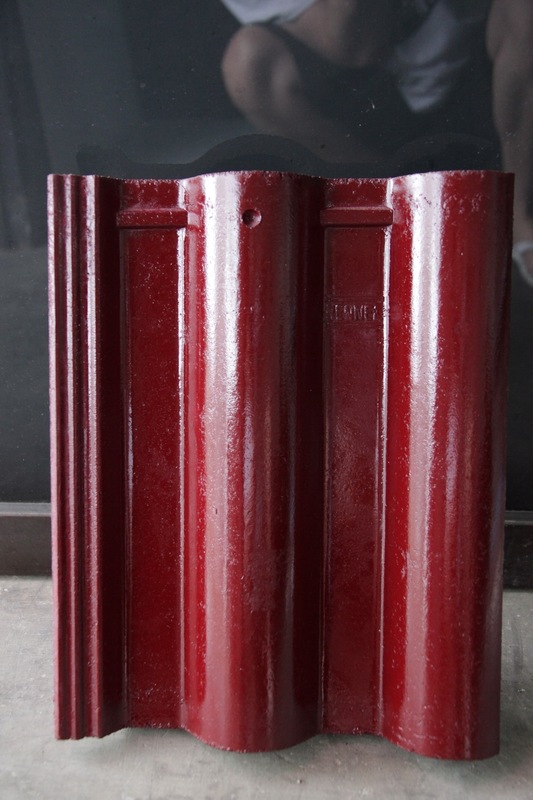 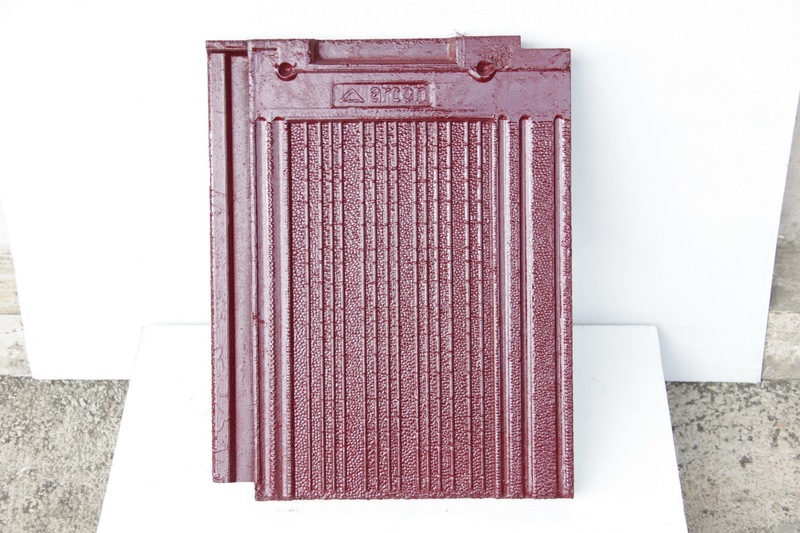 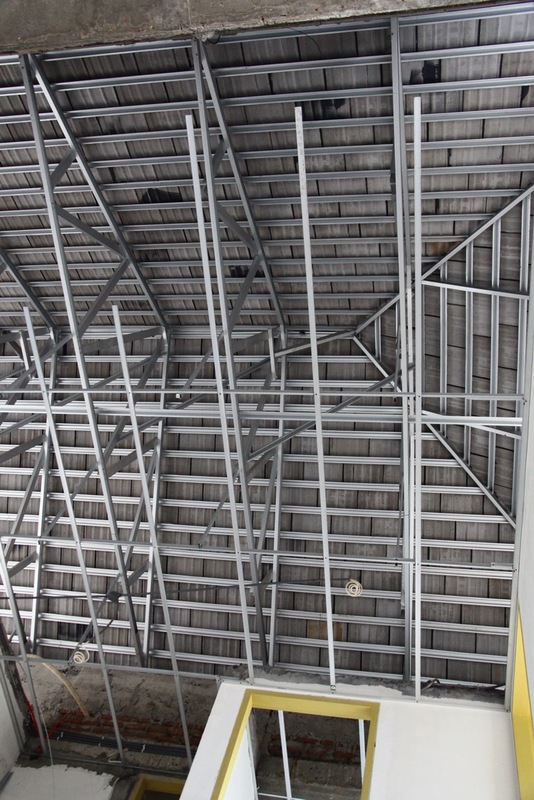 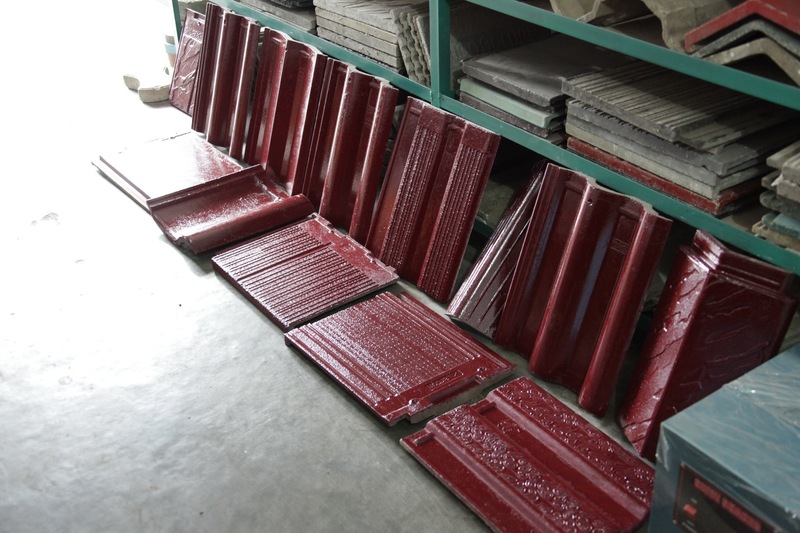 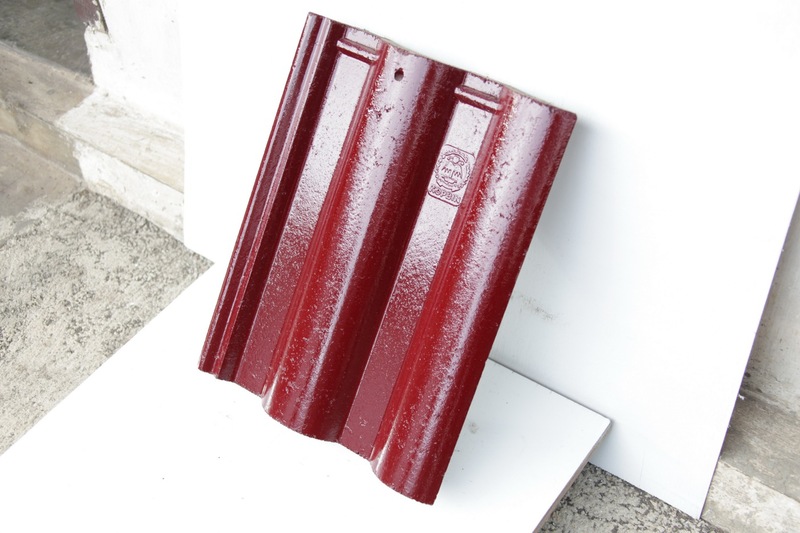 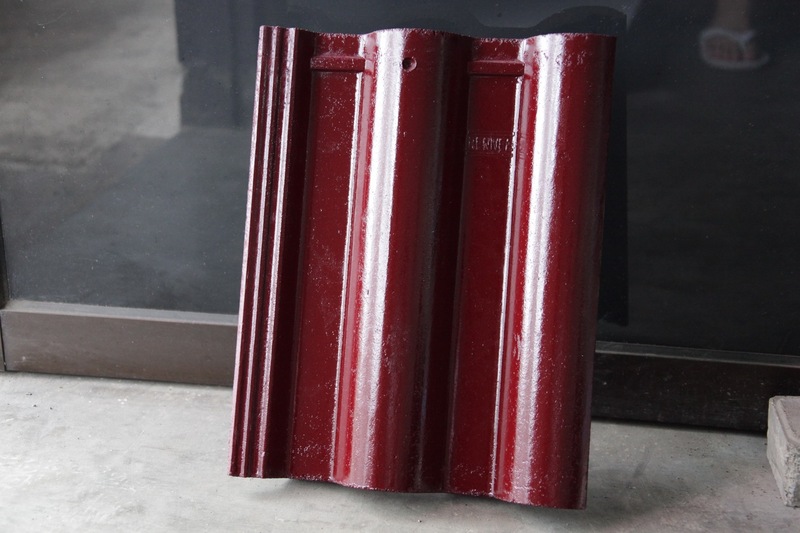 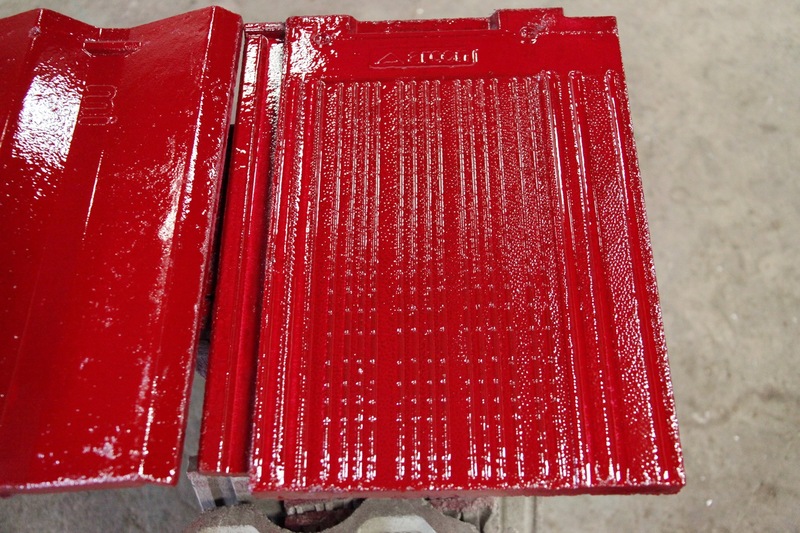 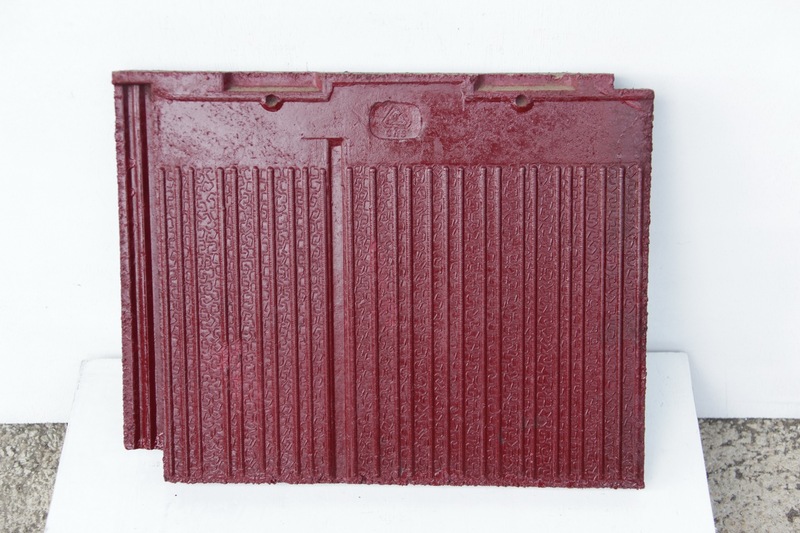 UNFORTUNETLY , TO PROTECT OUR ROOF MACHINES CUSTOMERS , I CANNOT DESCRIBE THE FORMULA OF THE PAINT . 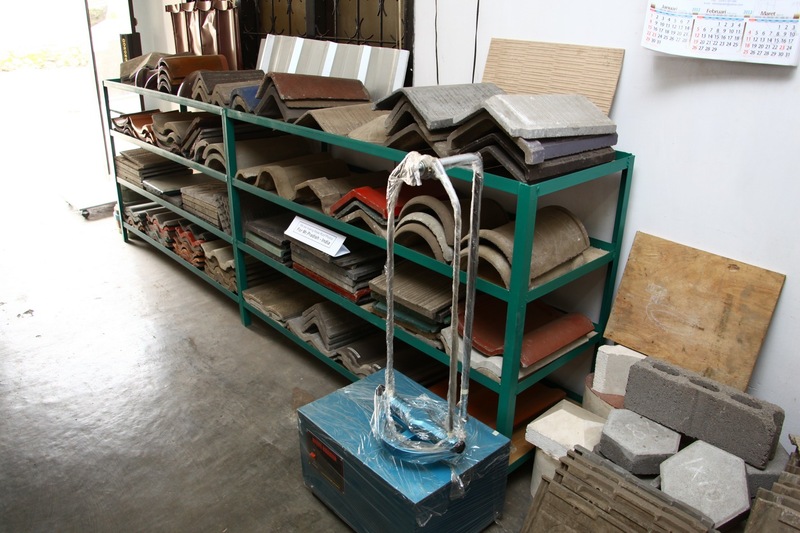 SO YOU HAVE TO MAKE EXPERIMENTS BY YOURSELF USING THE MATERIALS THAT ALREADY EXPLAINED ABOVE . 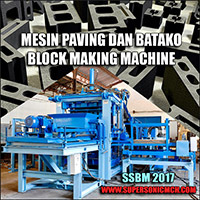 BUT IF YOU ARE ONE OF OUR CUSTOMERS , THEN YOU CAN EMAIL TO ME ( rudyiskandar86@hotmail.com ) TO GET THE FORMULA SEND TO YOUR EMAIL . 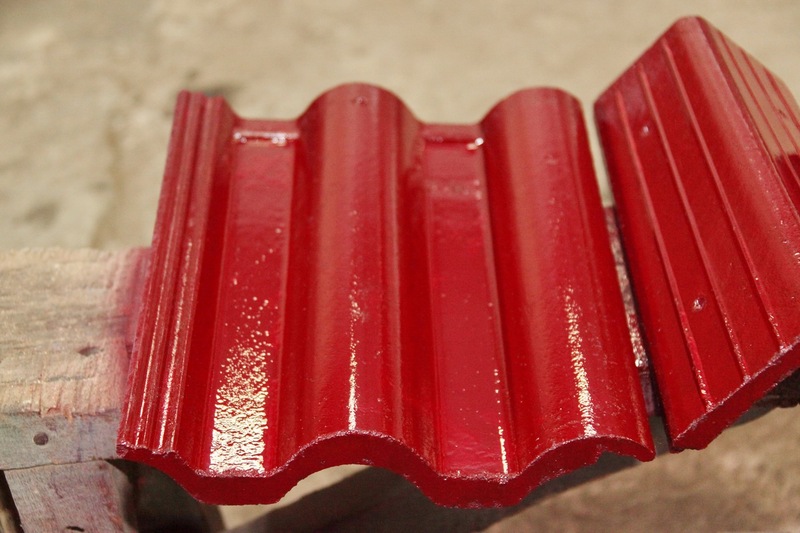 PAINTING ROOF TILES , WITH 2 LAYERS . 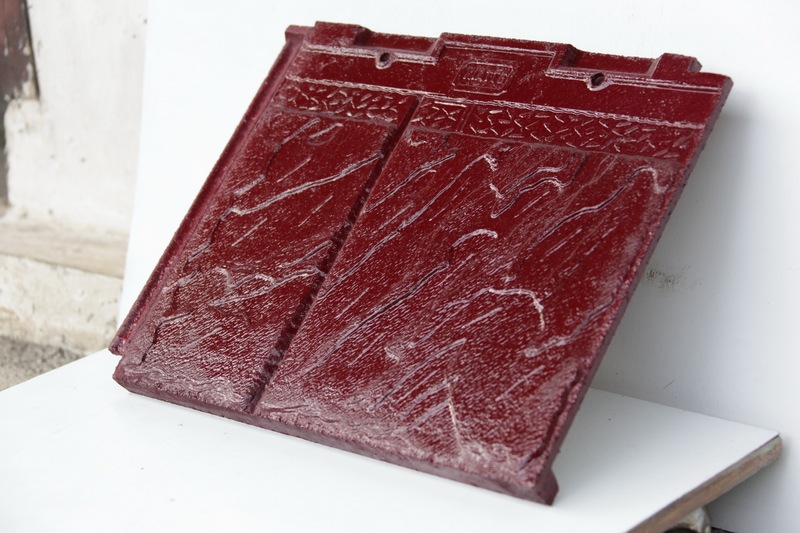 FIRST LAYER IS USING WATER BASE PAINT ( BECAUSE IT IS CHEAPER ) , THEN THE SECOND LAYER IS USING THE OIL BASE PAINT . 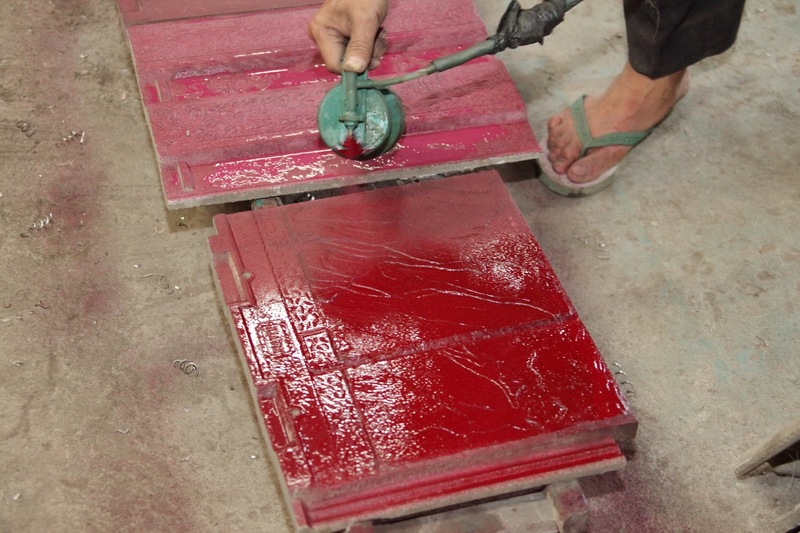 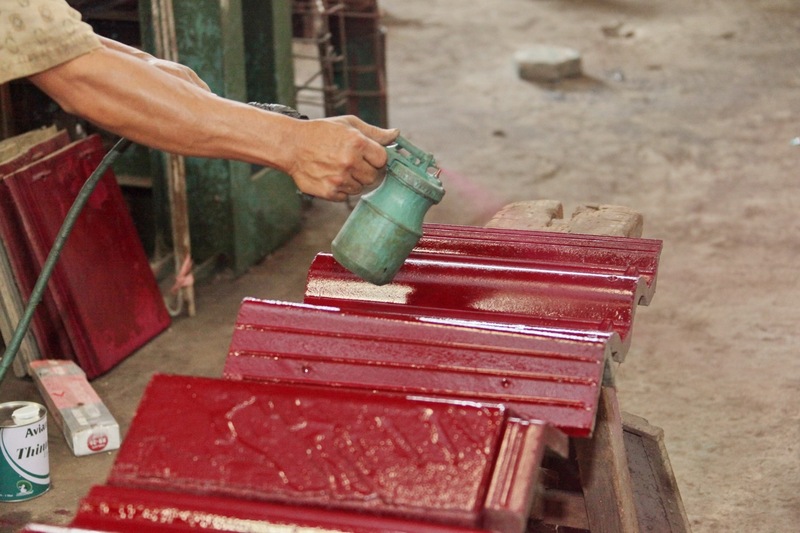 AND WE PAINT THE TILES USING SPRAY GUN , POWERED BY AIR COMPRESSOR UNIT . 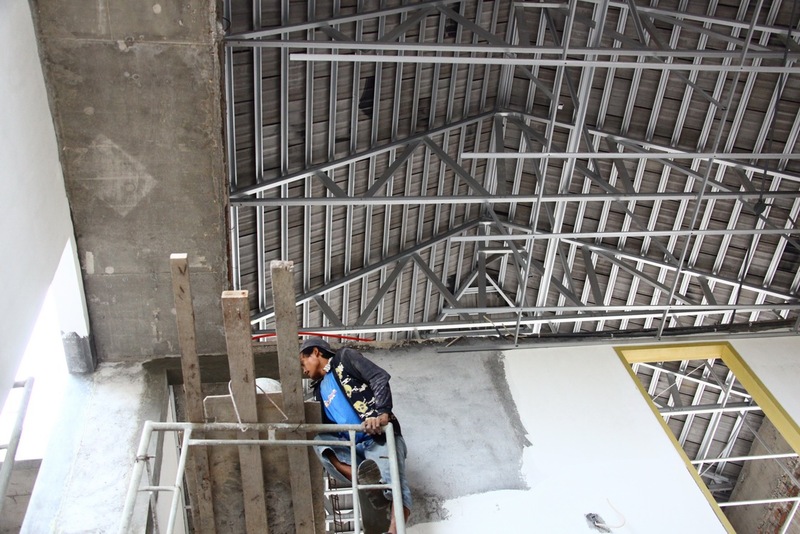 Then the worker can continue the steps above to finish all the painting job . 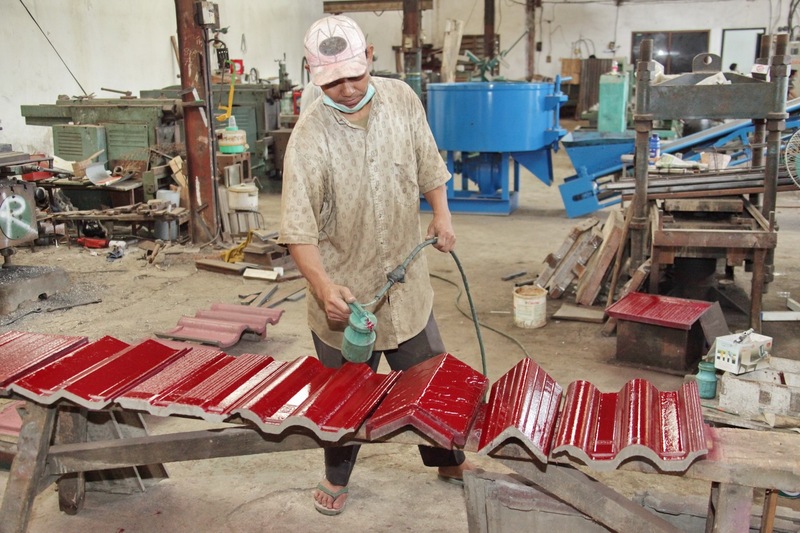 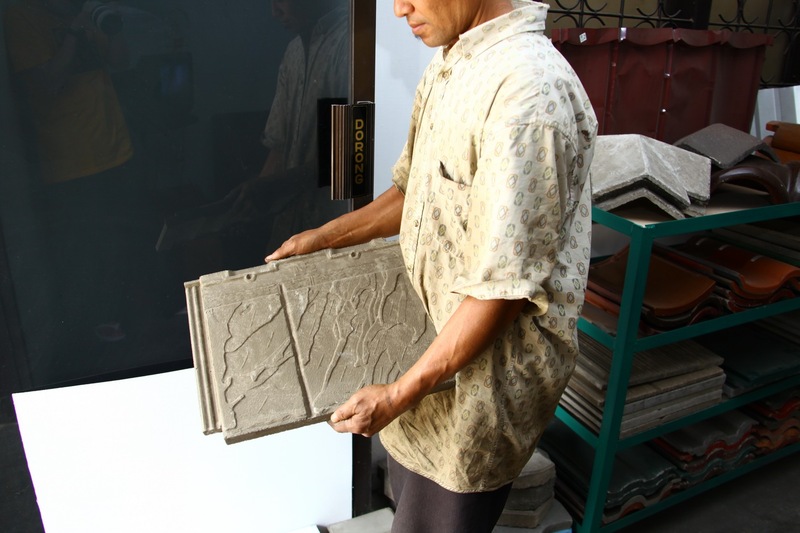 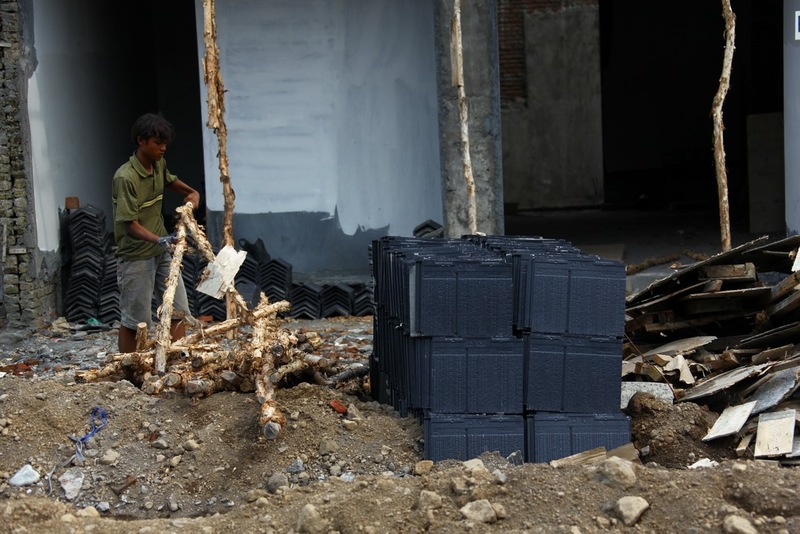 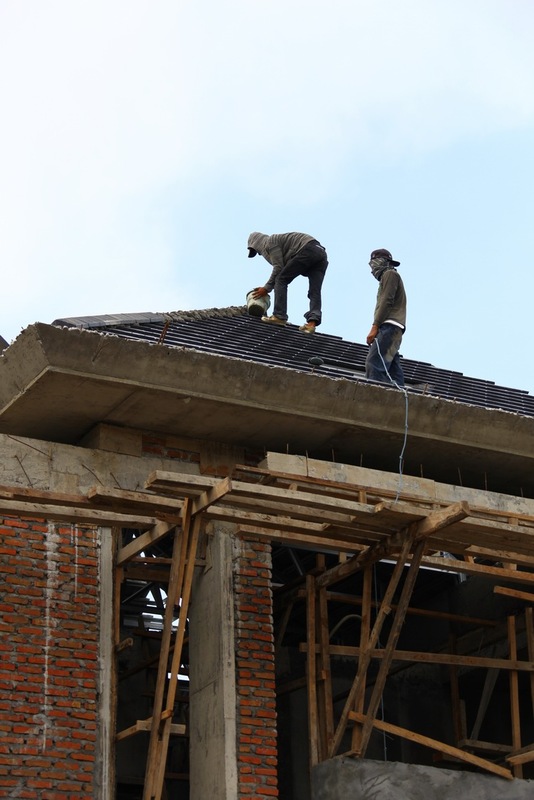 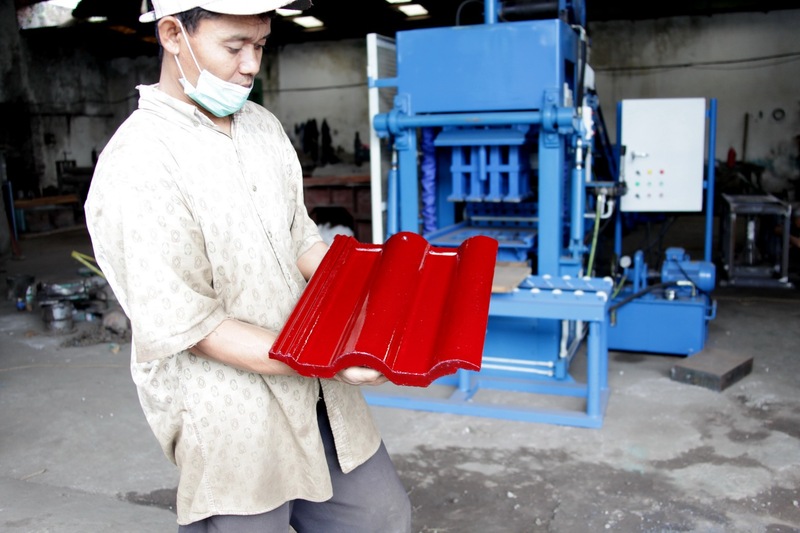 Normally , 2 workers can paint 1000 pcs of roof tile per day ( 7 hours working time ) . 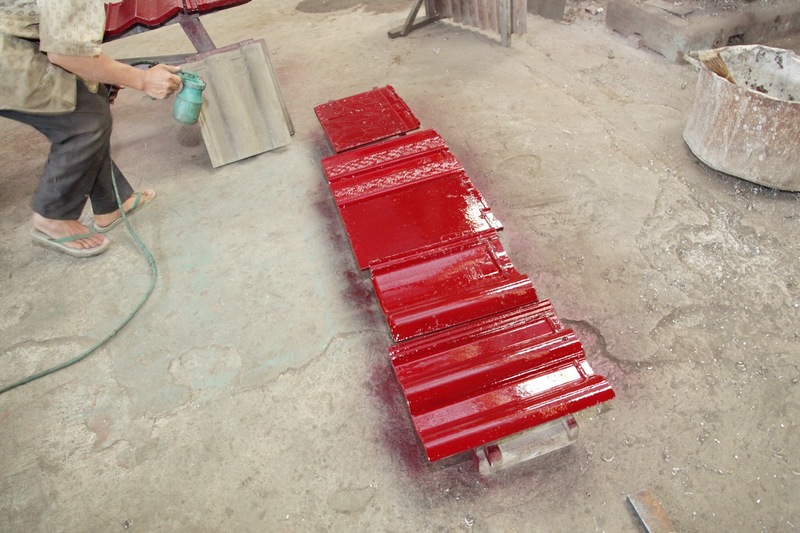 THE PAINT RESULT WILL BE MORE SHINY IF YOU PAINT THEM UNDER THE SUN LIGHT . 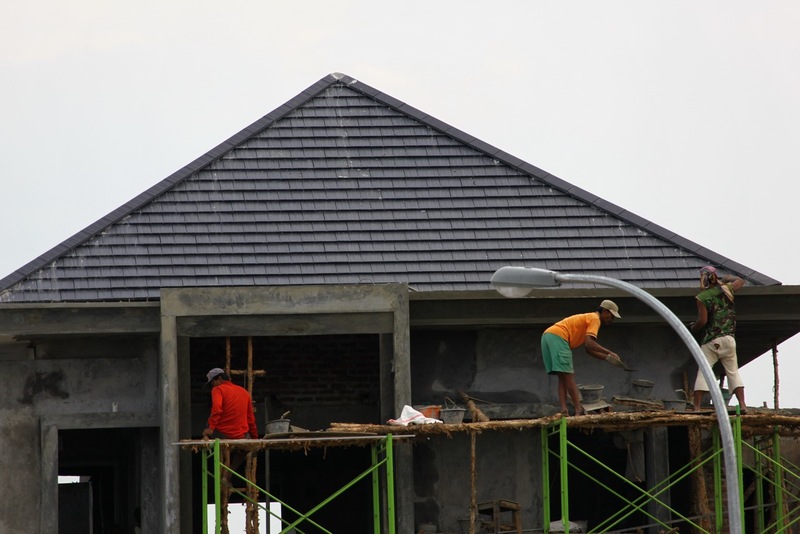 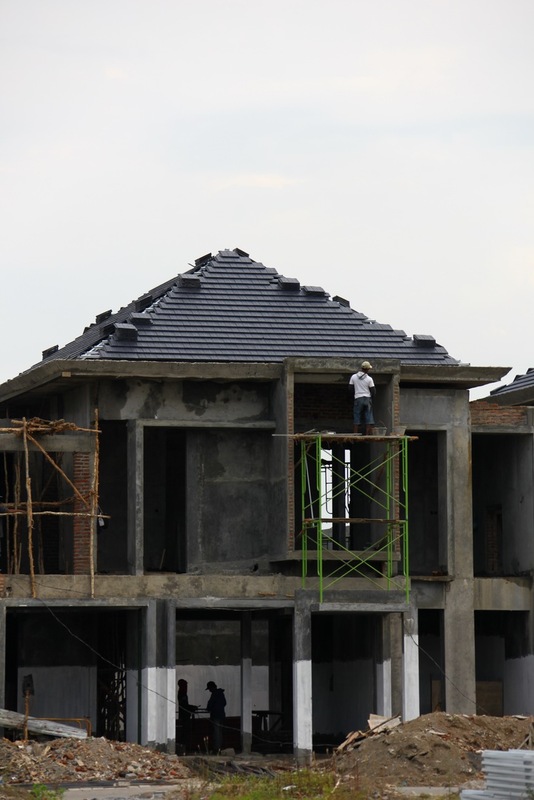 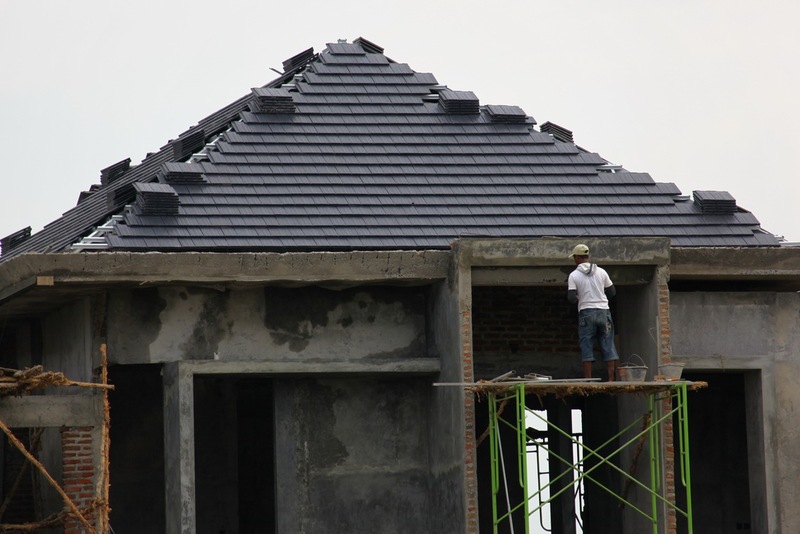 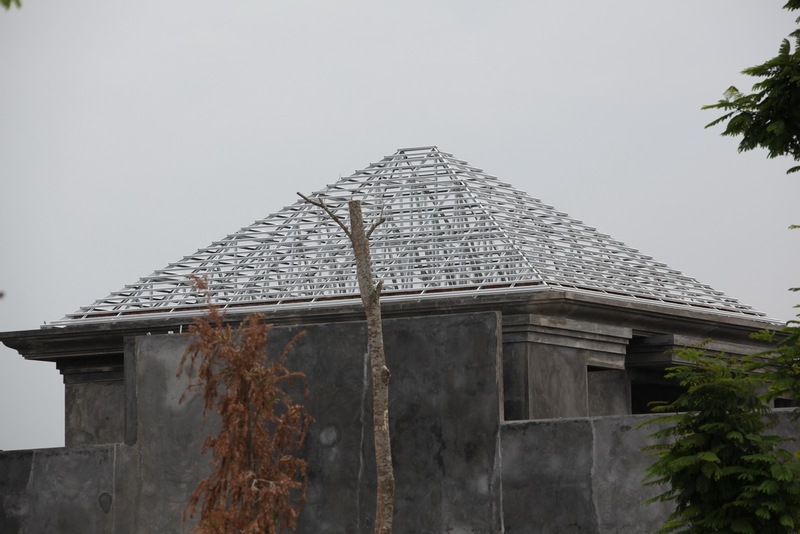 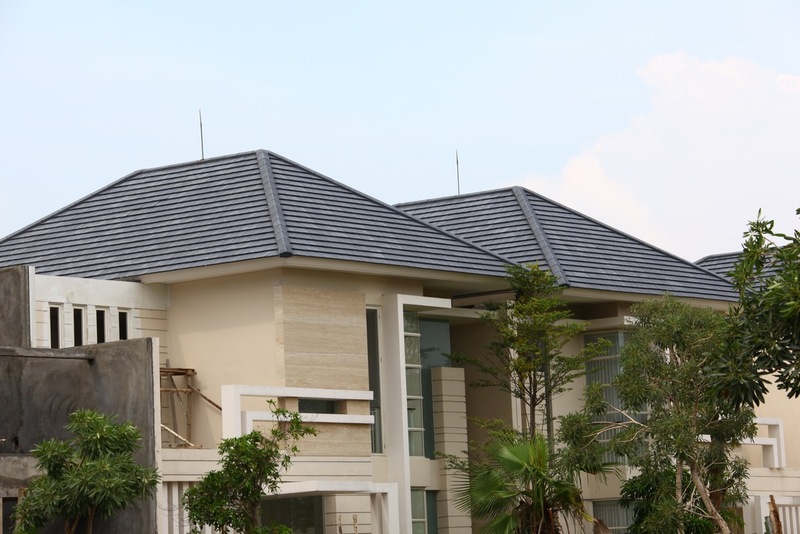 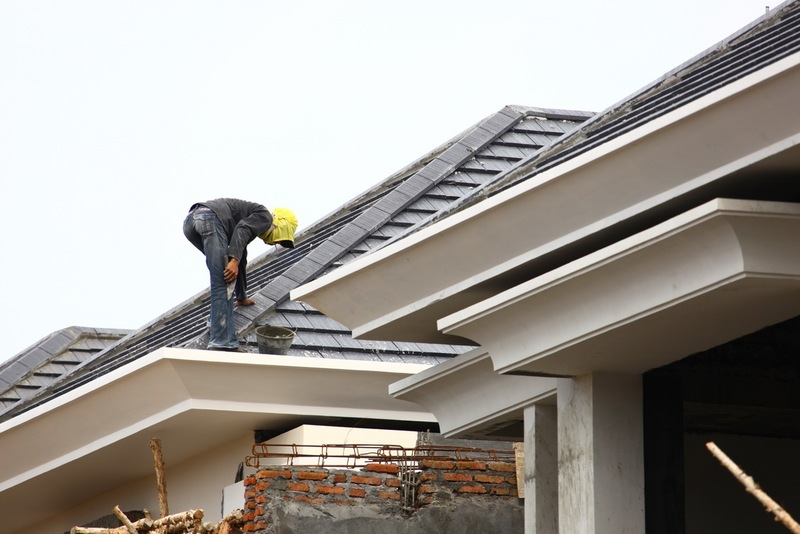 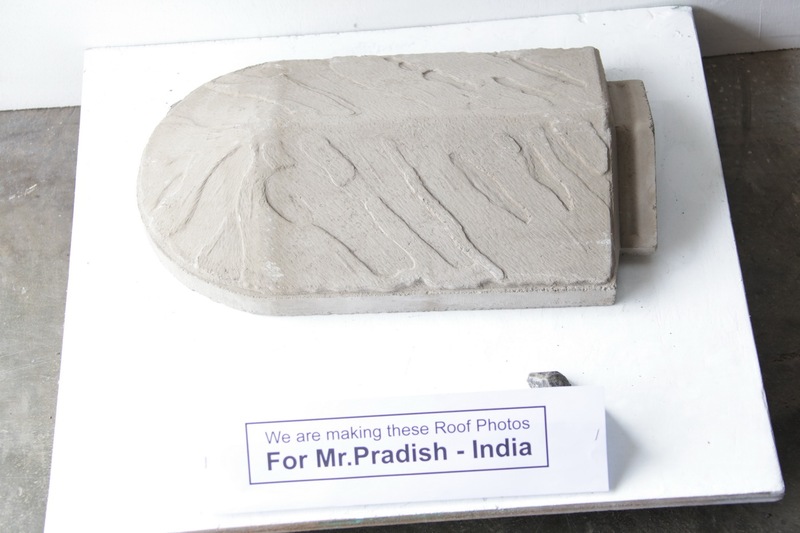 ANOTHER WAY TO PAINT THE ROOF , IS PAINT THEM WHILE ALREADY ASSEMBLIED ON THE ROOF TOP ( ON THE HOUSE ) . 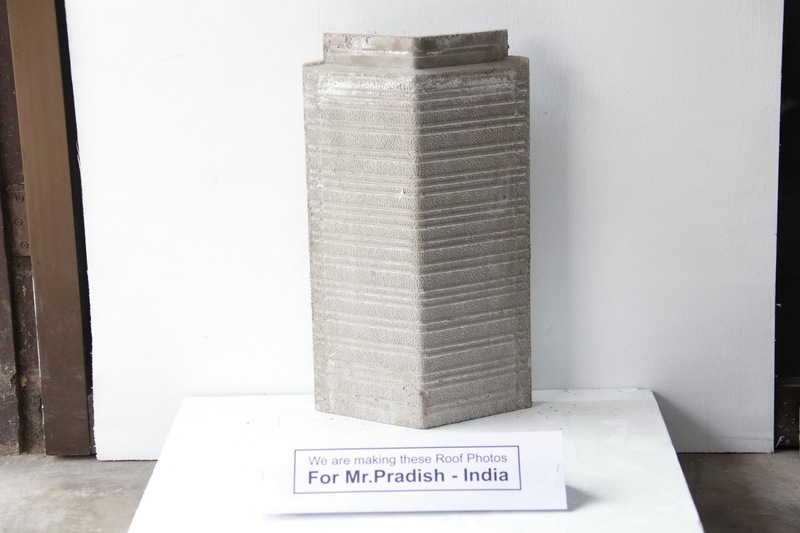 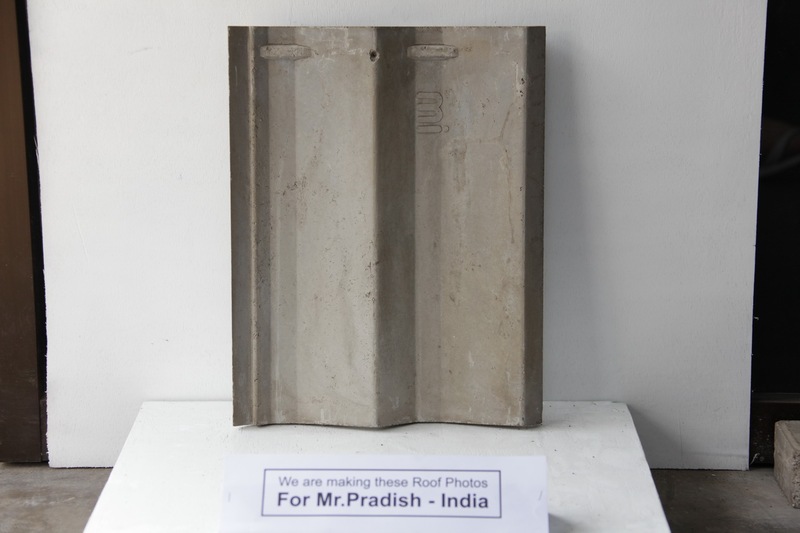 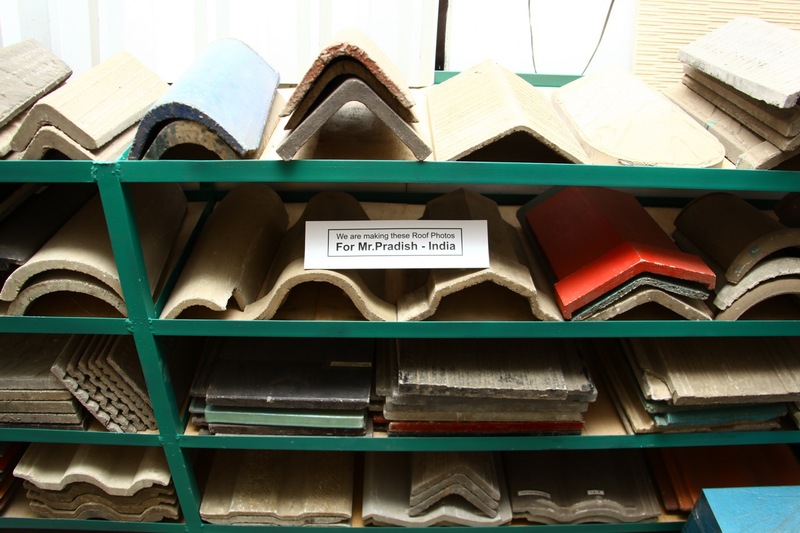 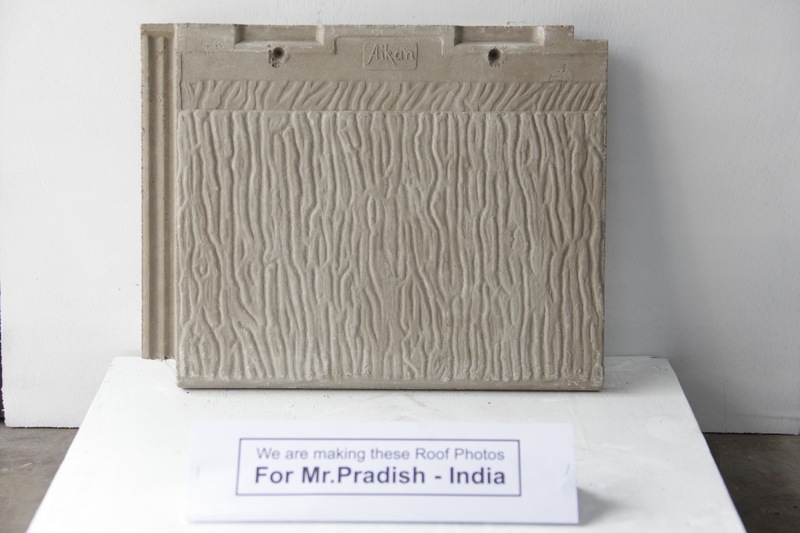 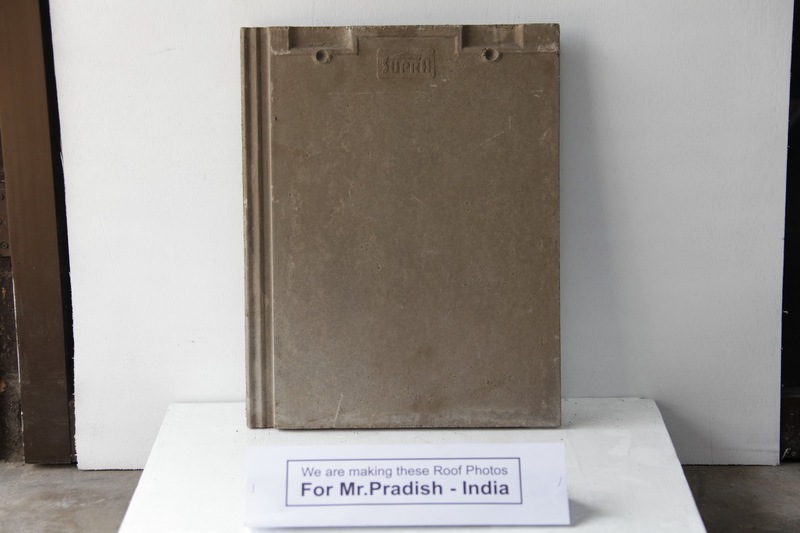 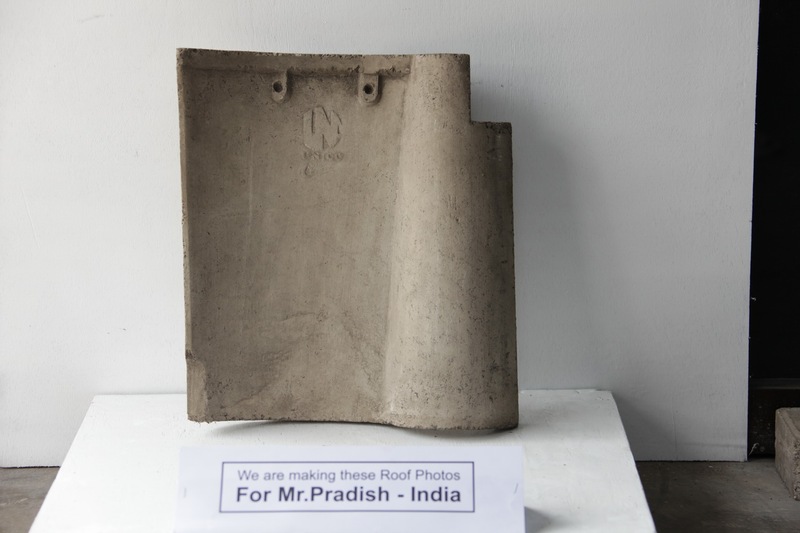 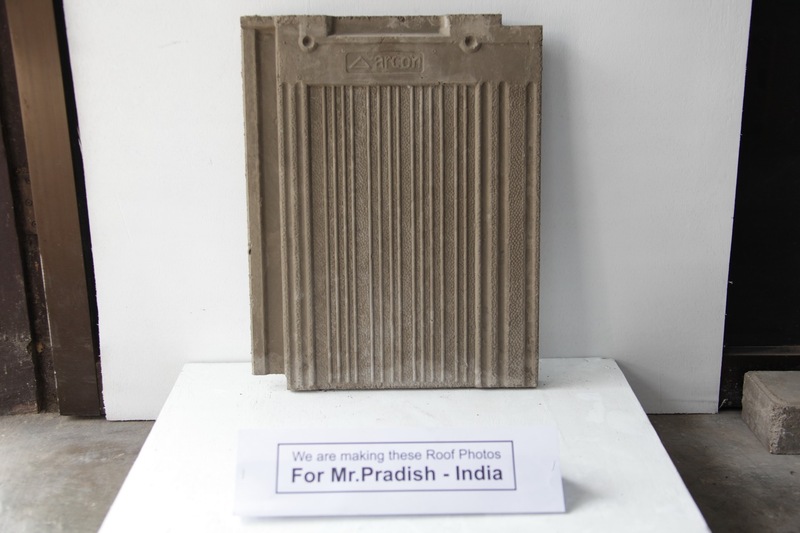 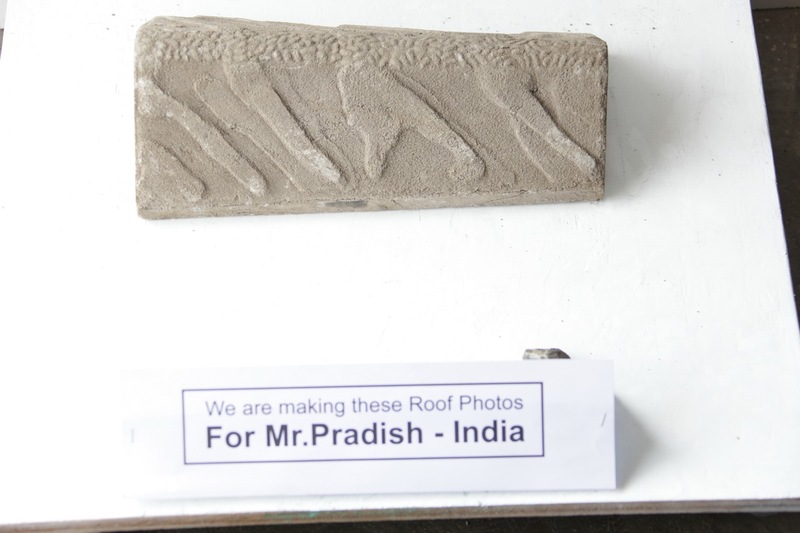 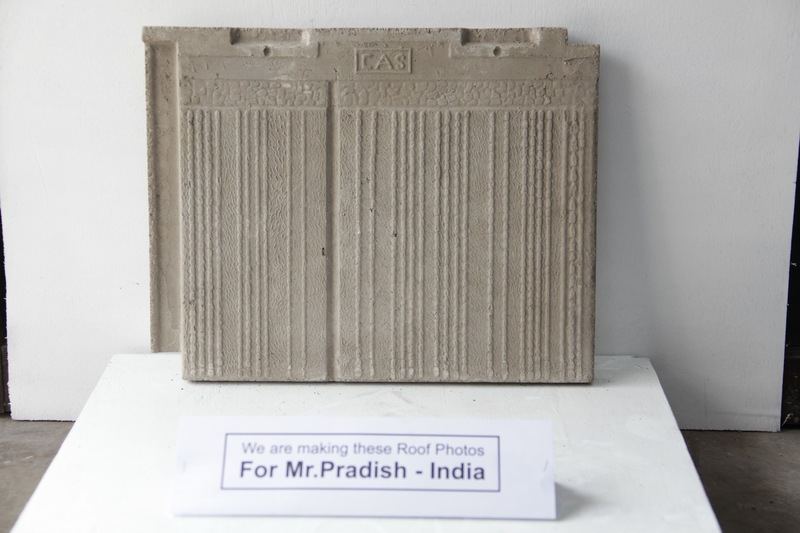 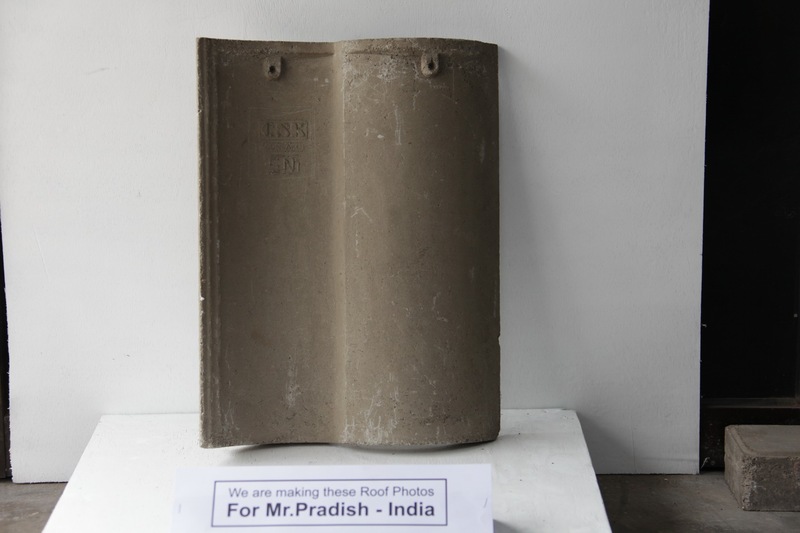 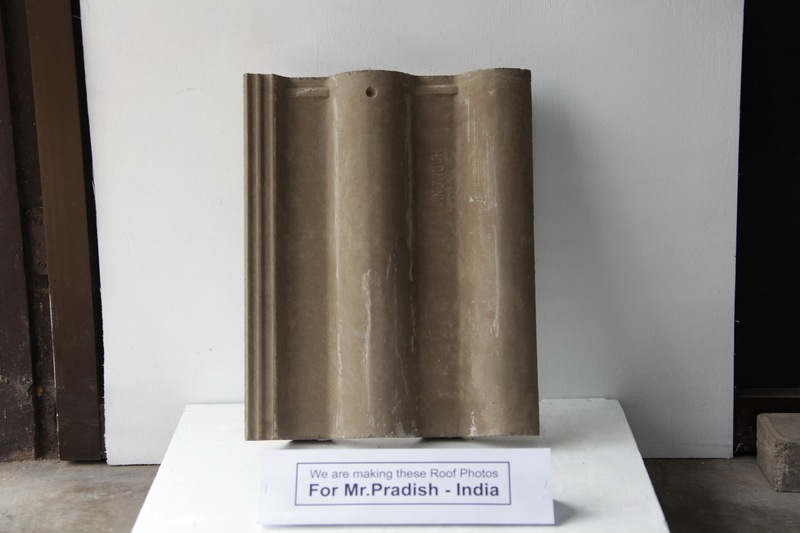 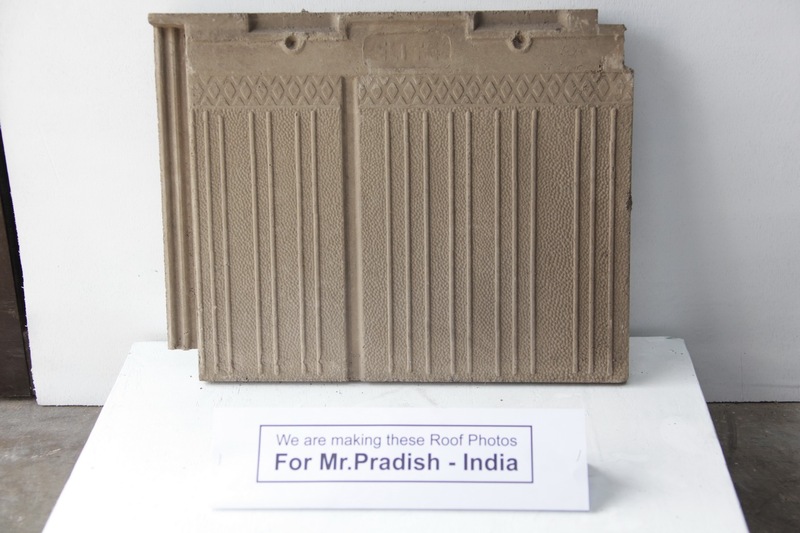 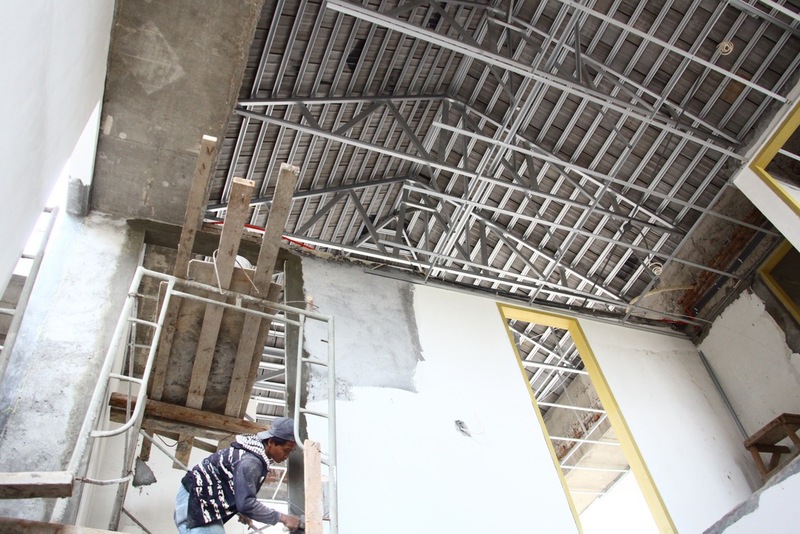 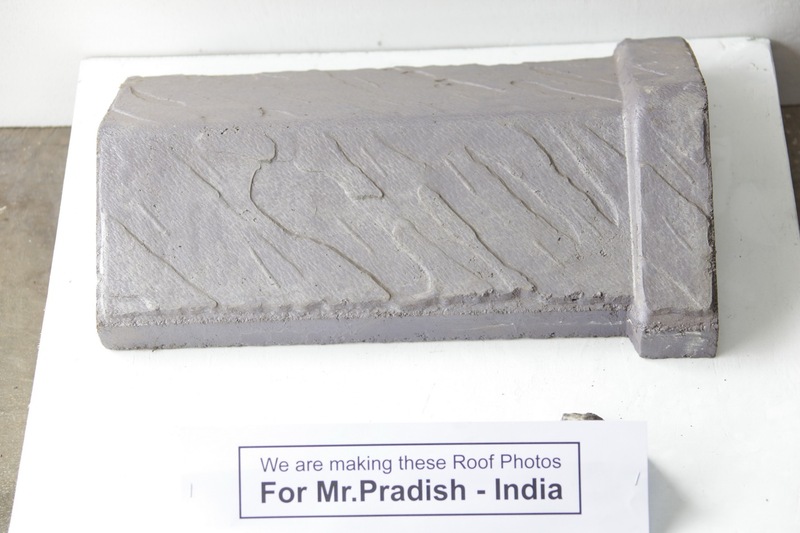 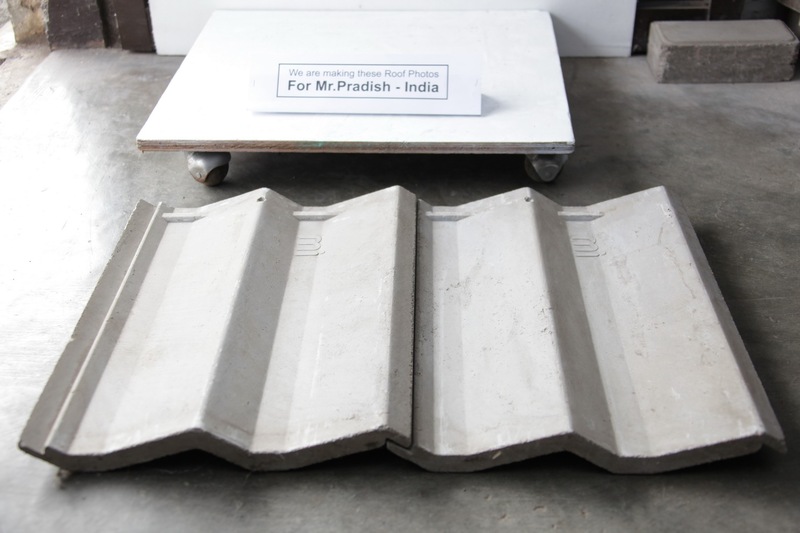 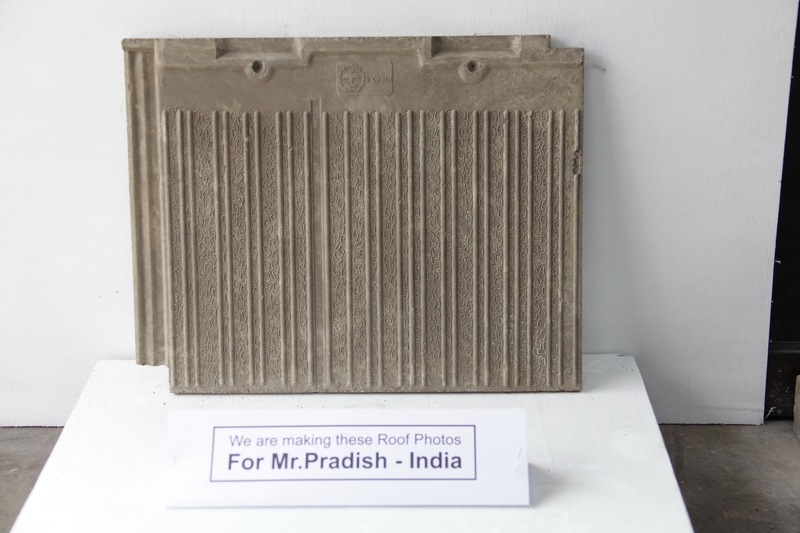 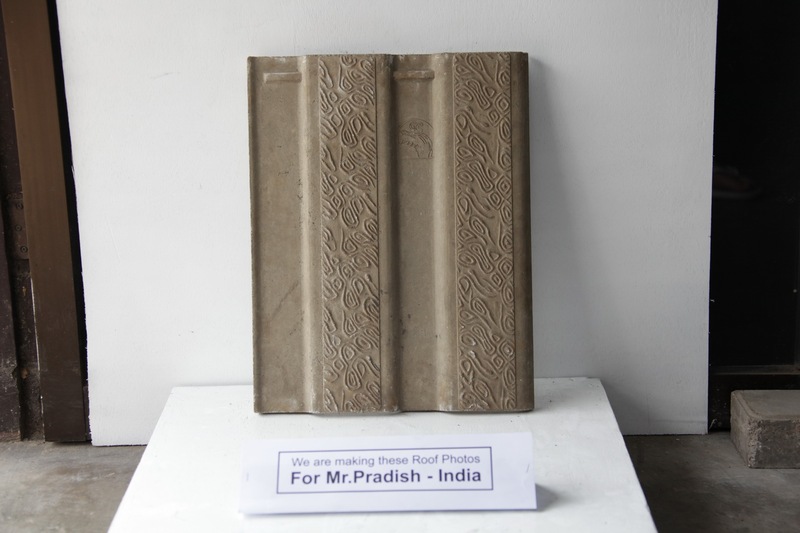 Here I took some photos for Mr.Pradish ( India ) , explaining the roof models he want to see . 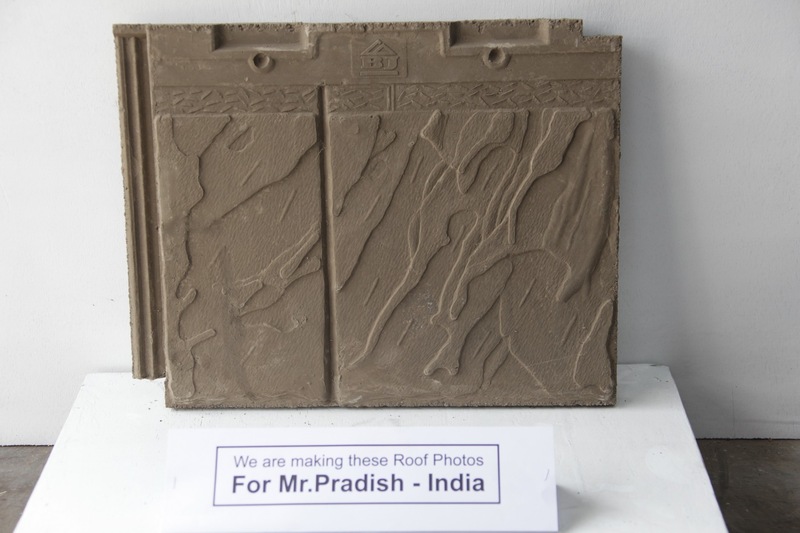 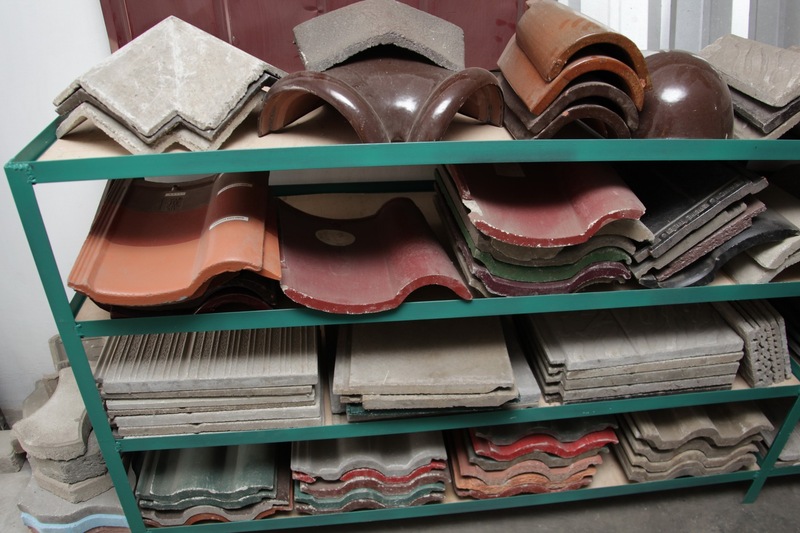 I took the photos today at my office , and below is the photos of the roof samples collection in my front office . 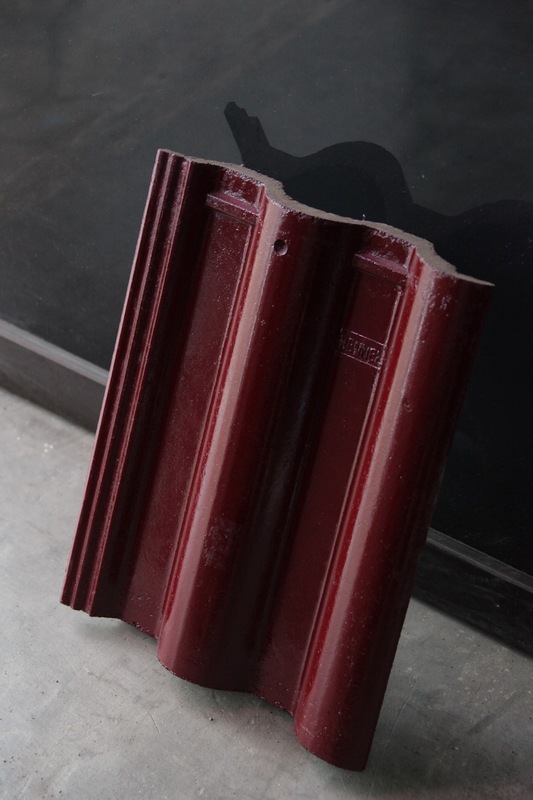 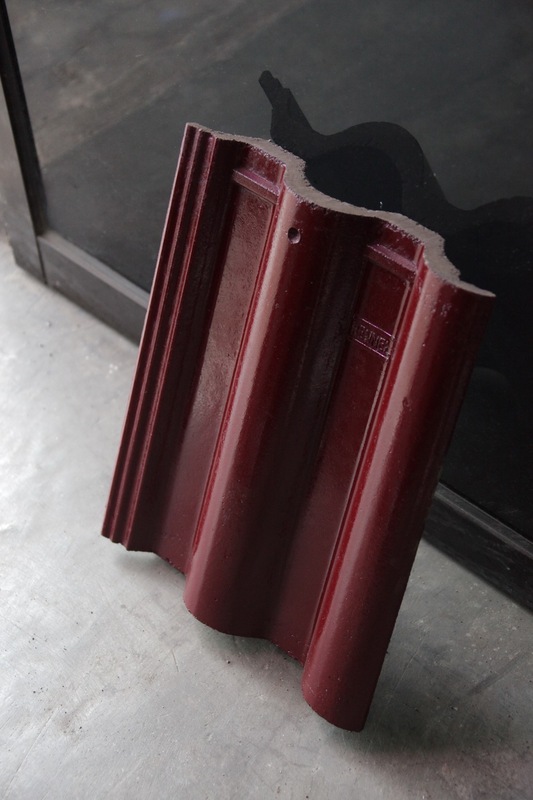 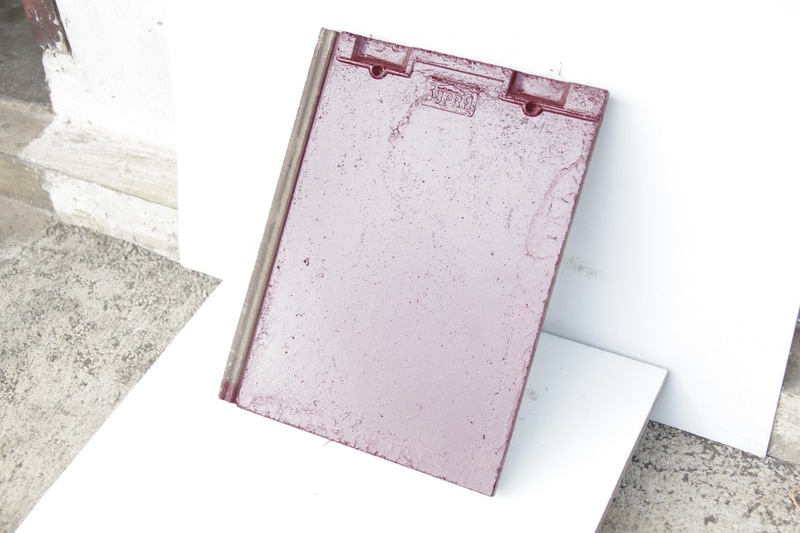 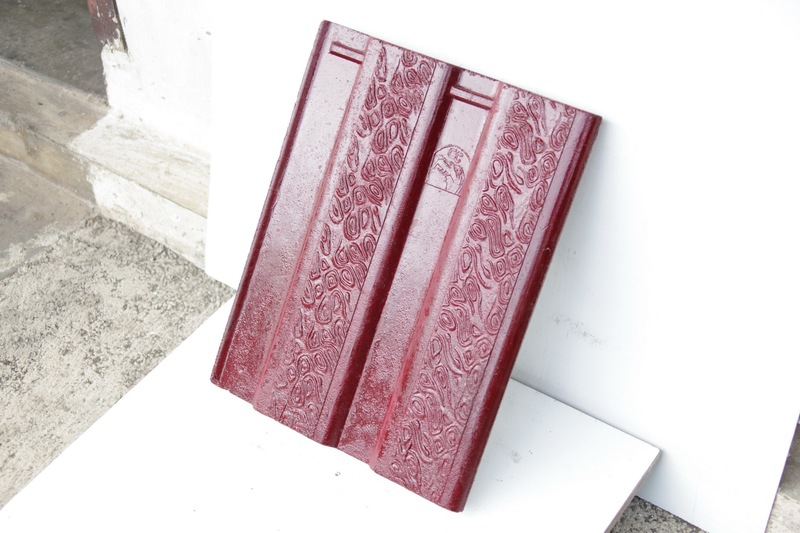 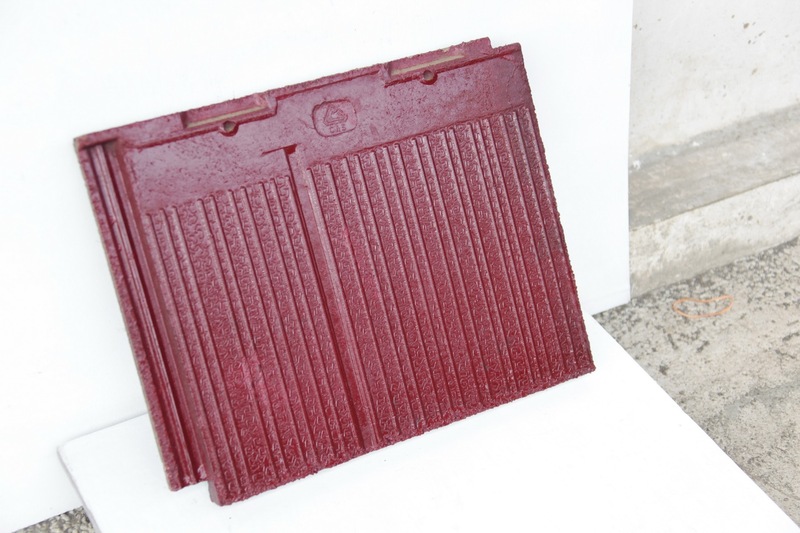 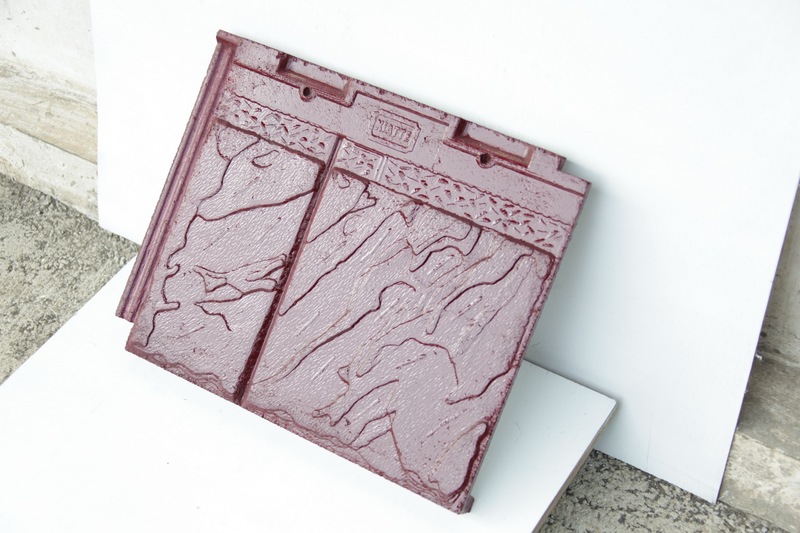 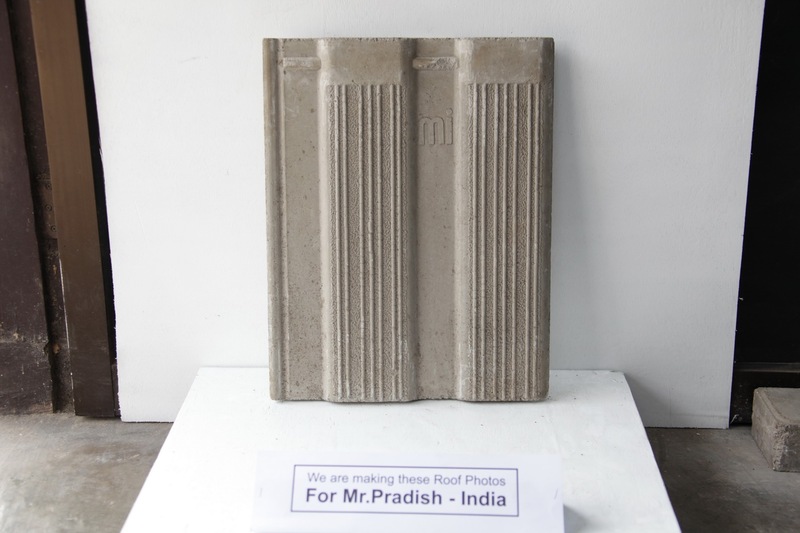 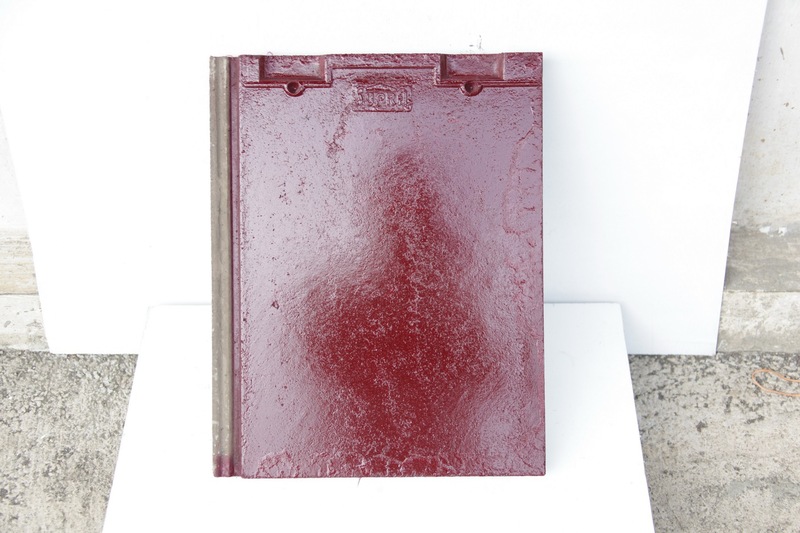 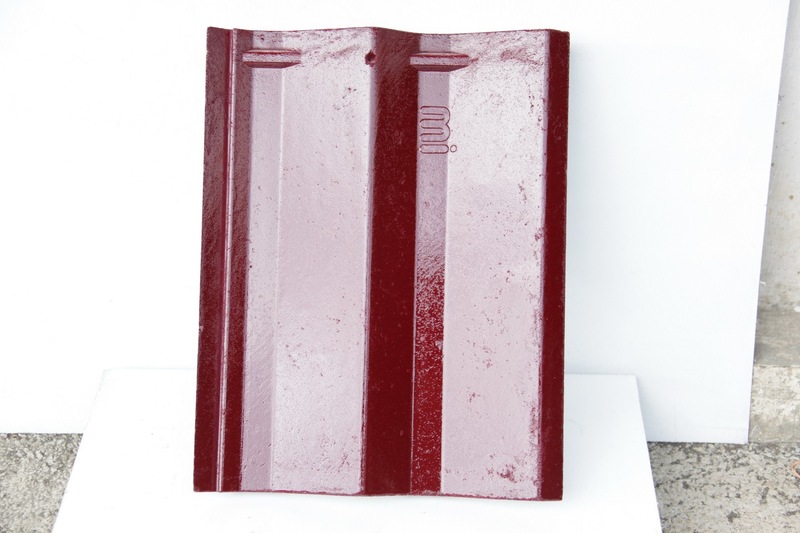 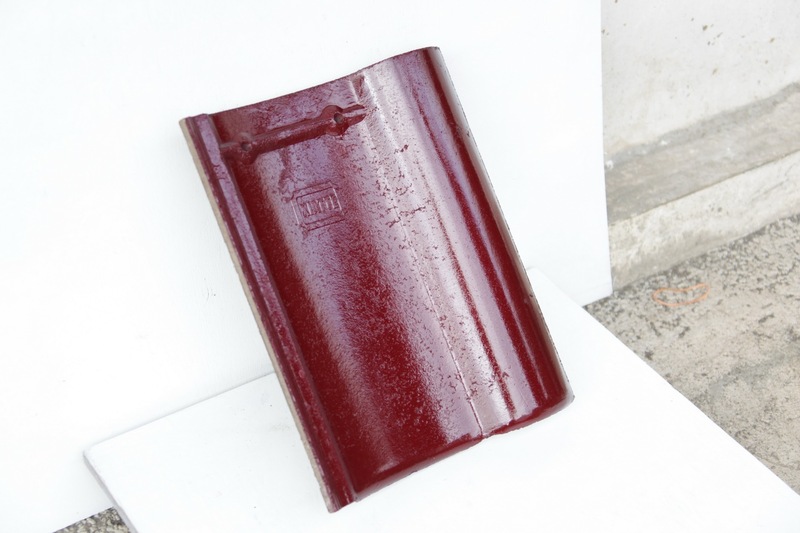 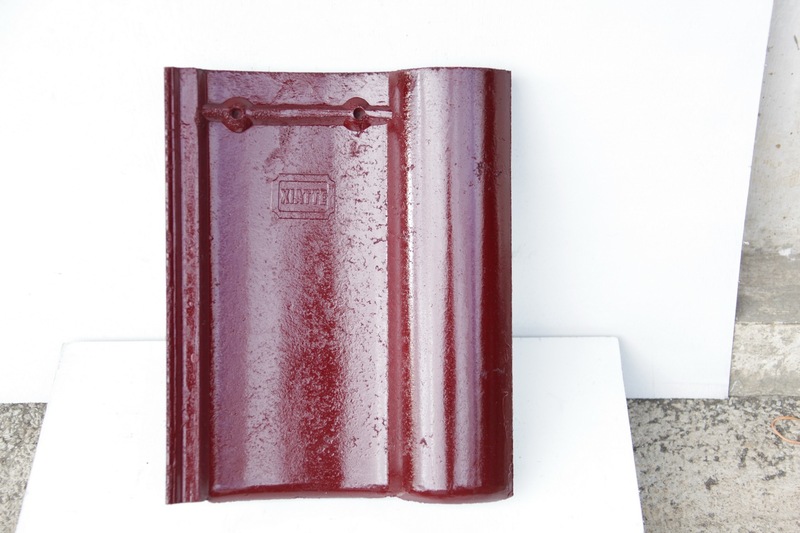 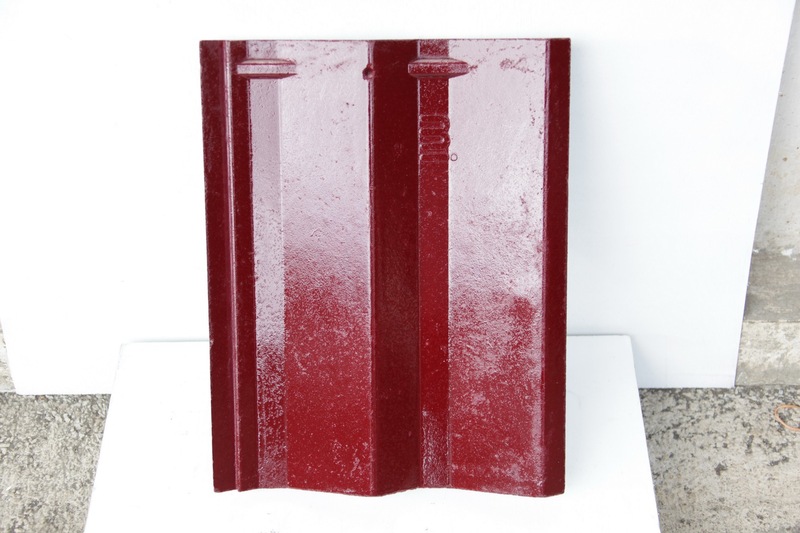 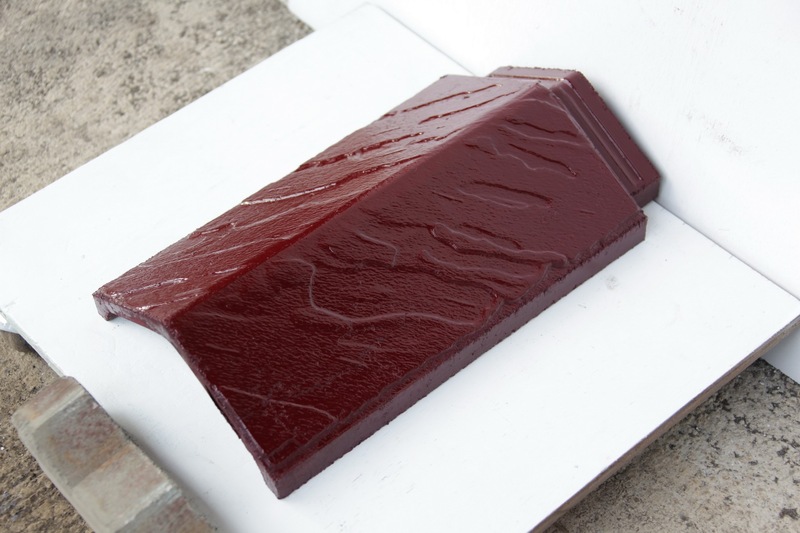 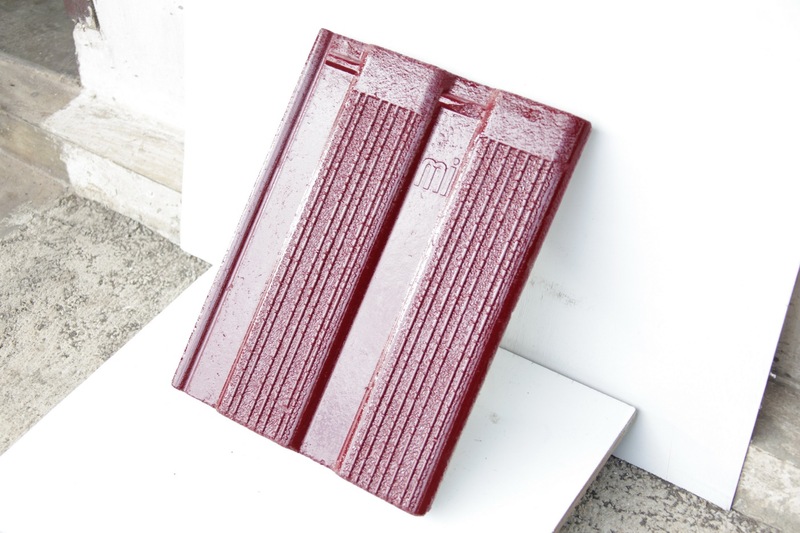 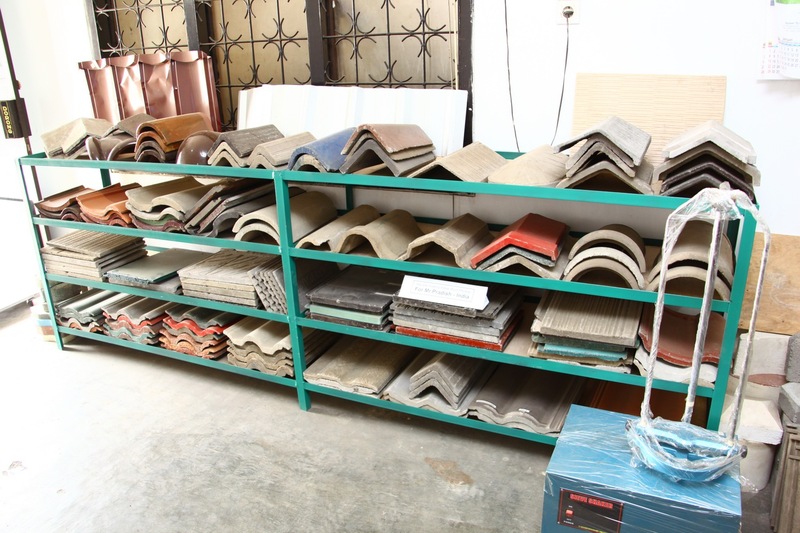 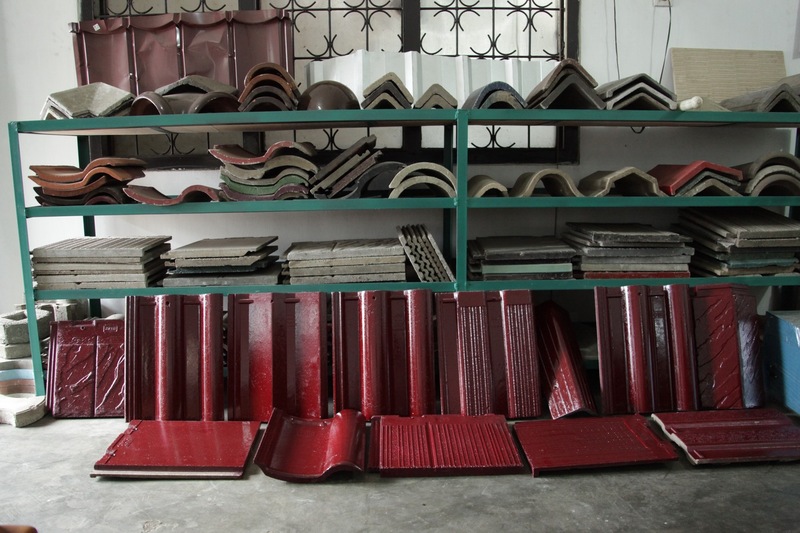 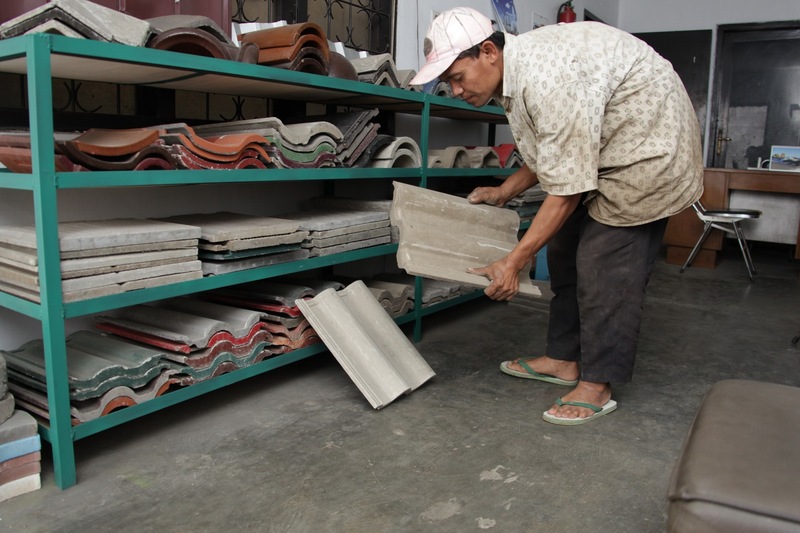 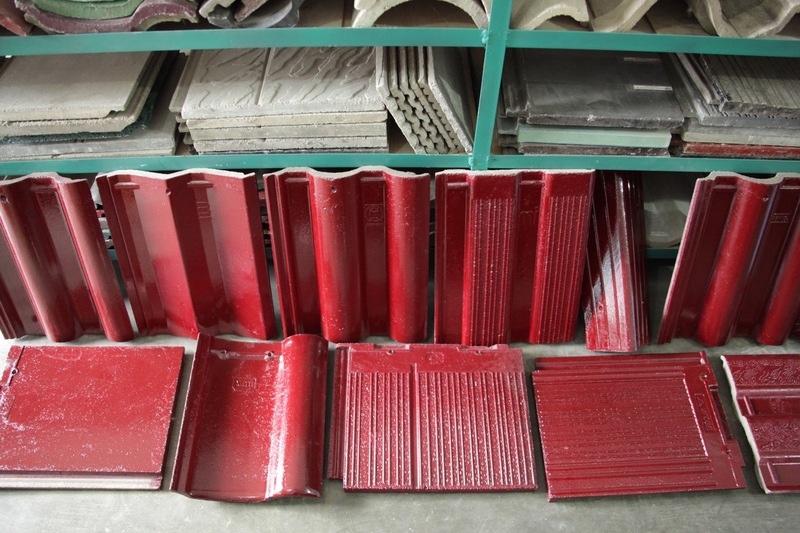 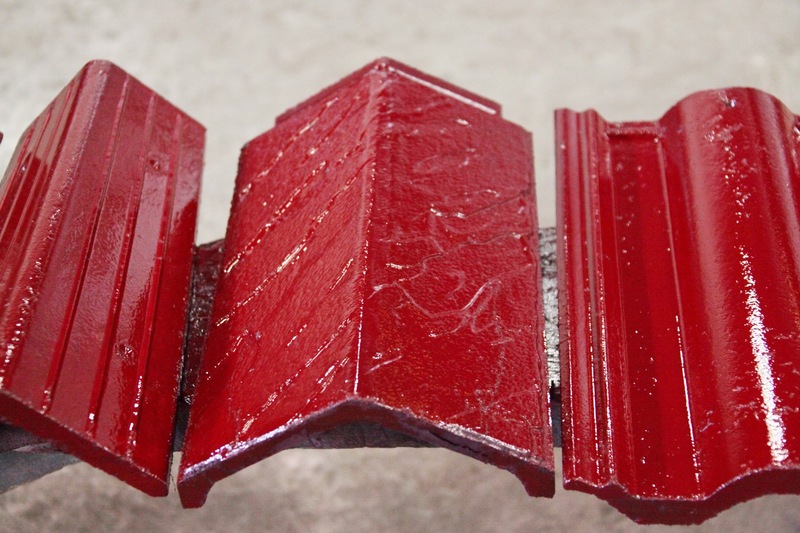 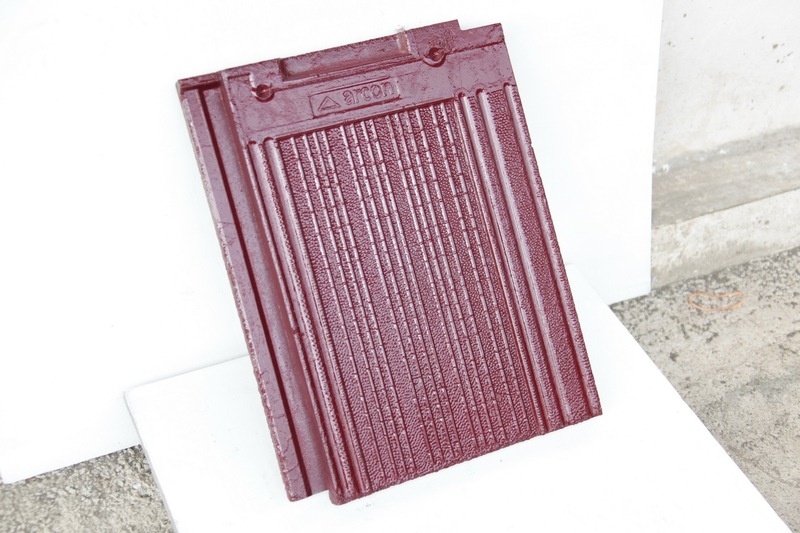 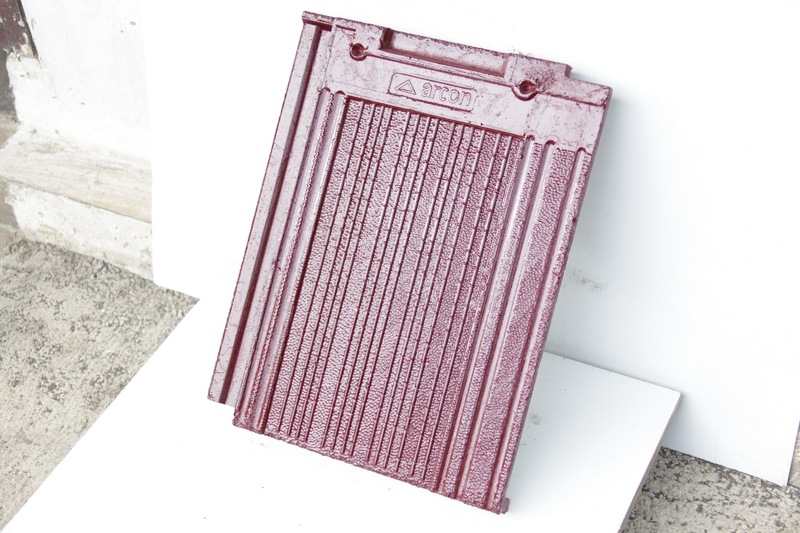 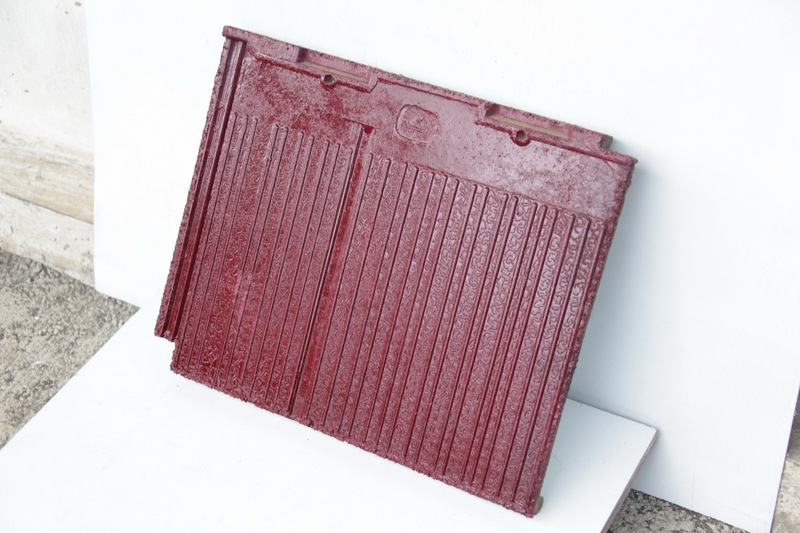 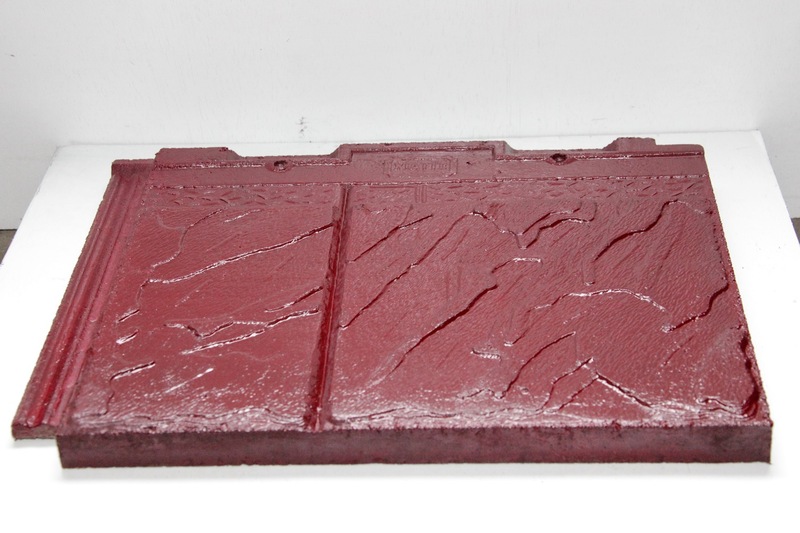 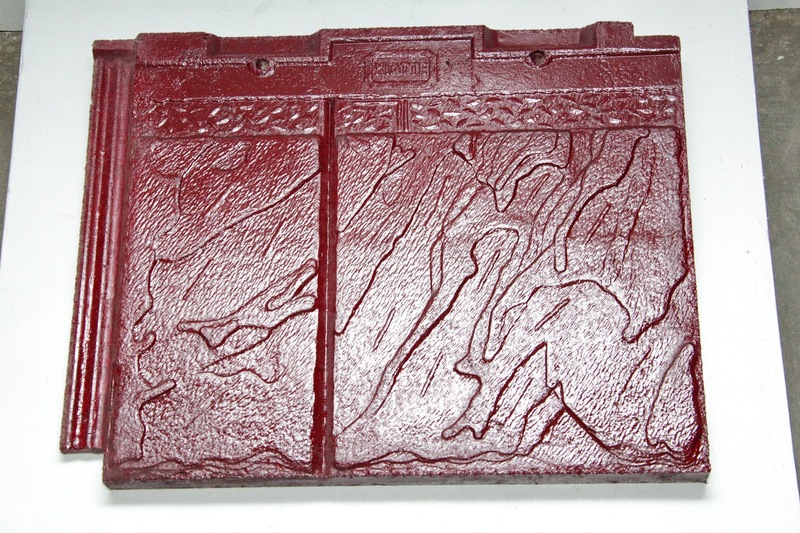 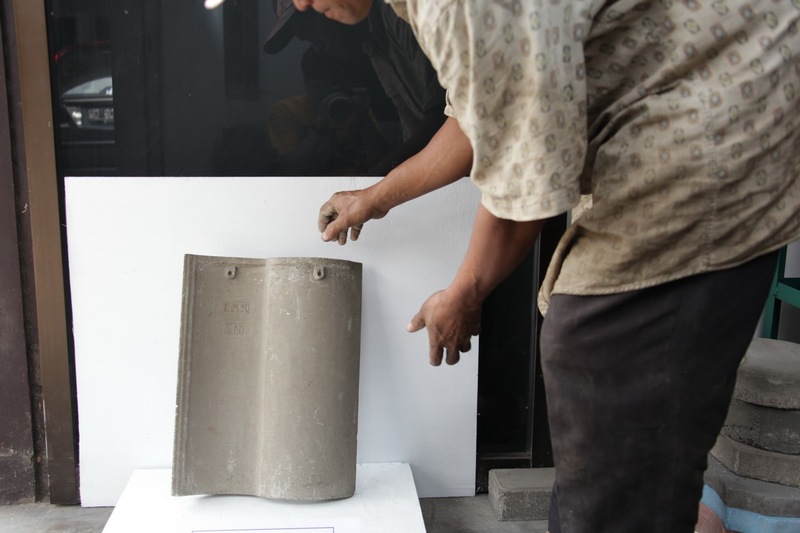 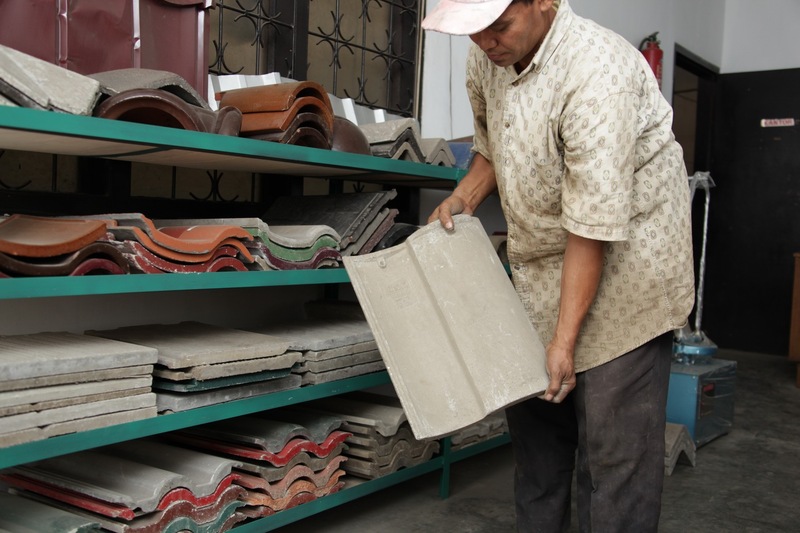 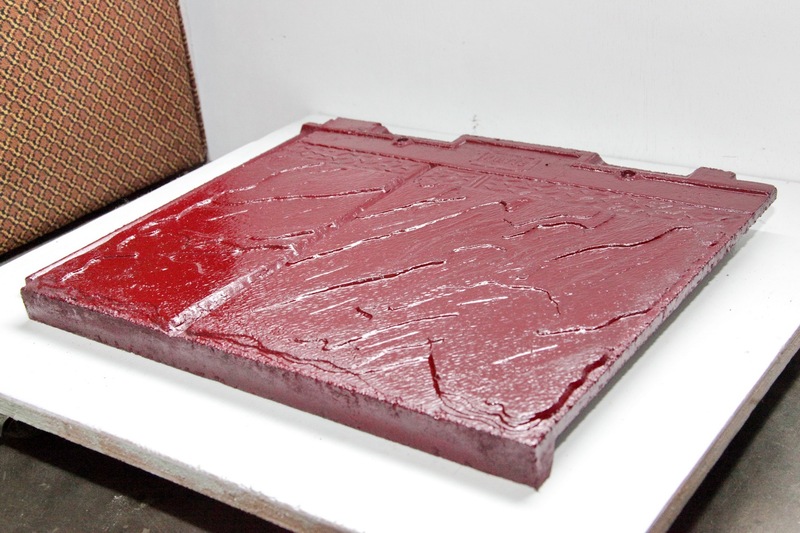 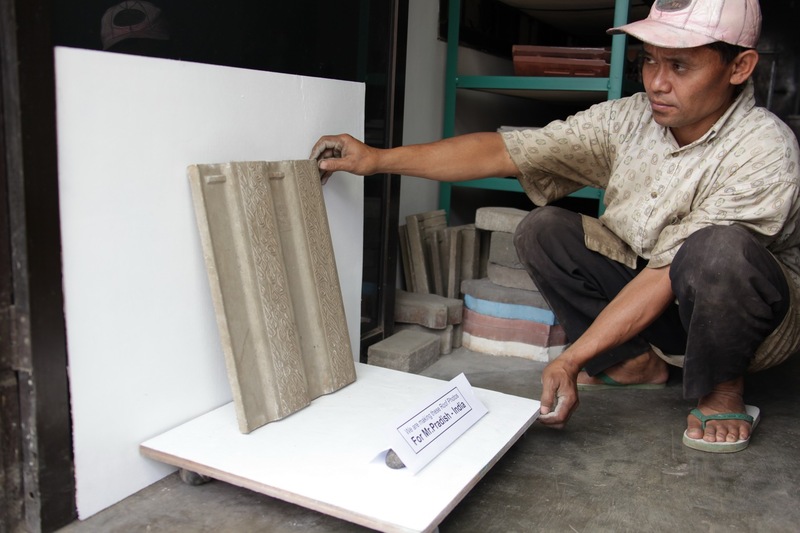 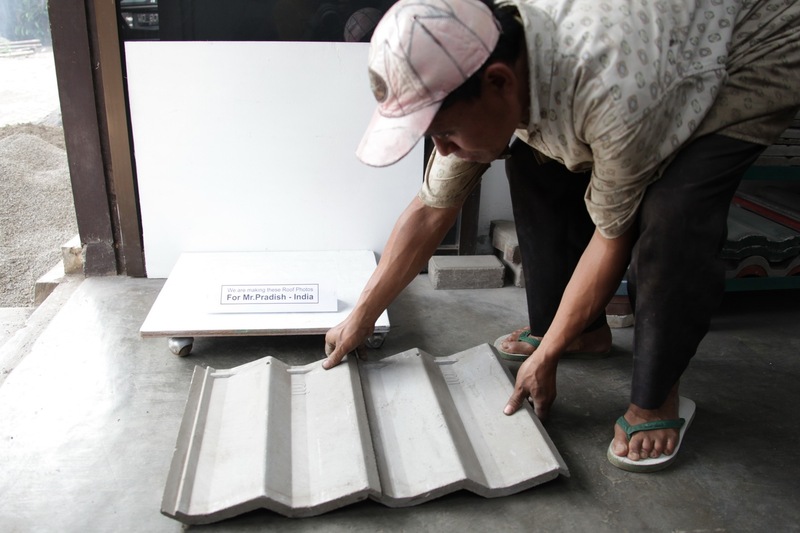 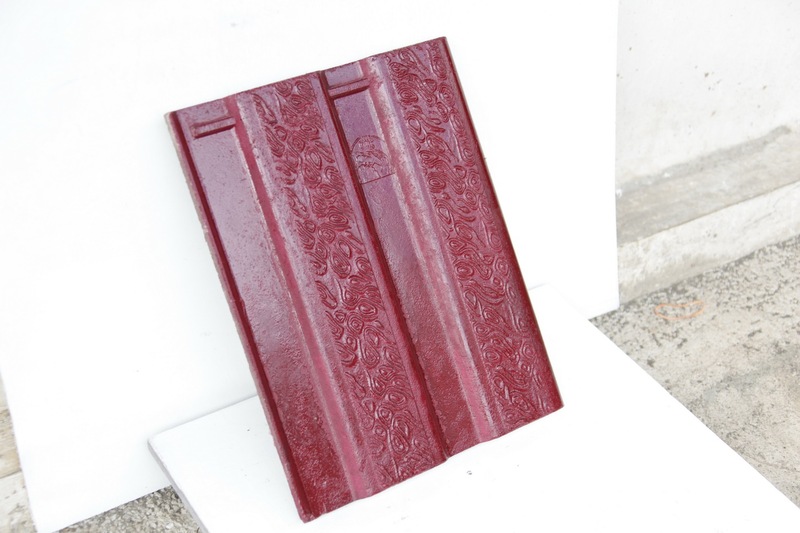 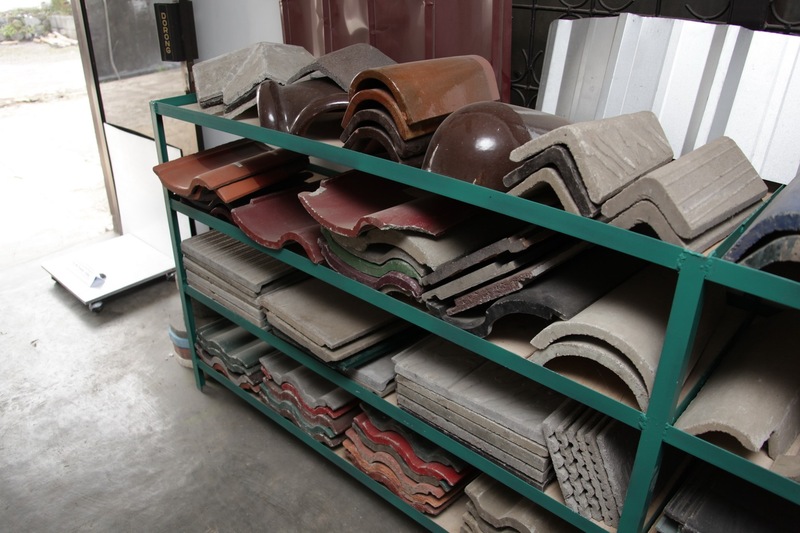 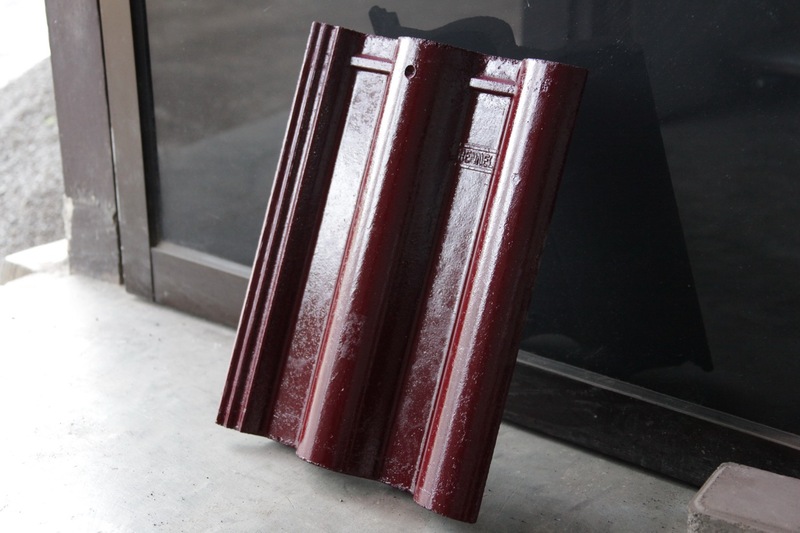 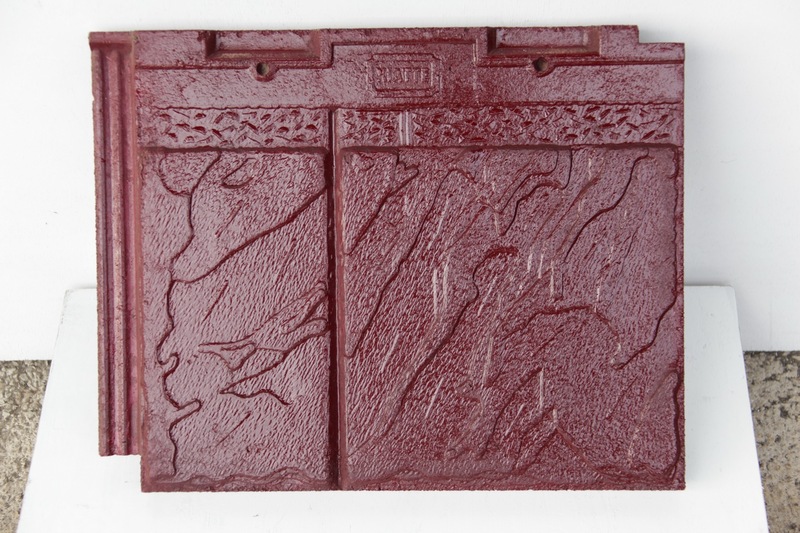 Most of the samples are from the results we were testing our concrete roof machines and molds . 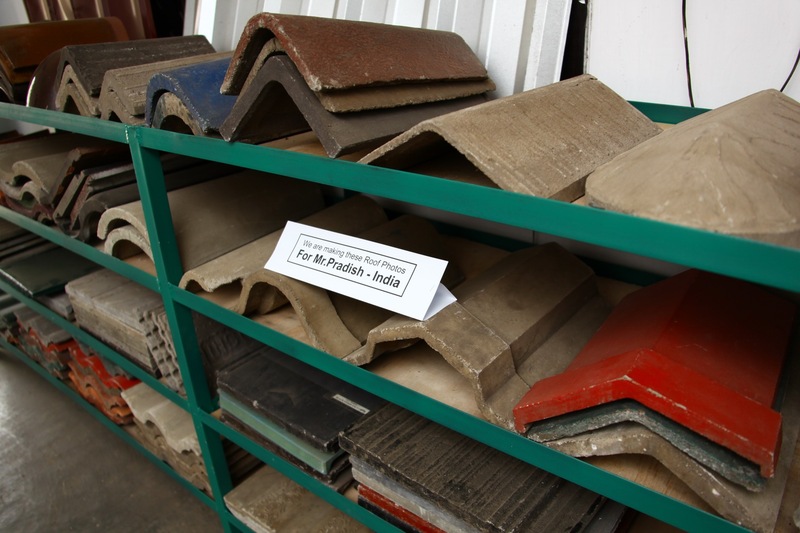 I am collecting those roof samples from 1990 and still have more models in our waresouse . 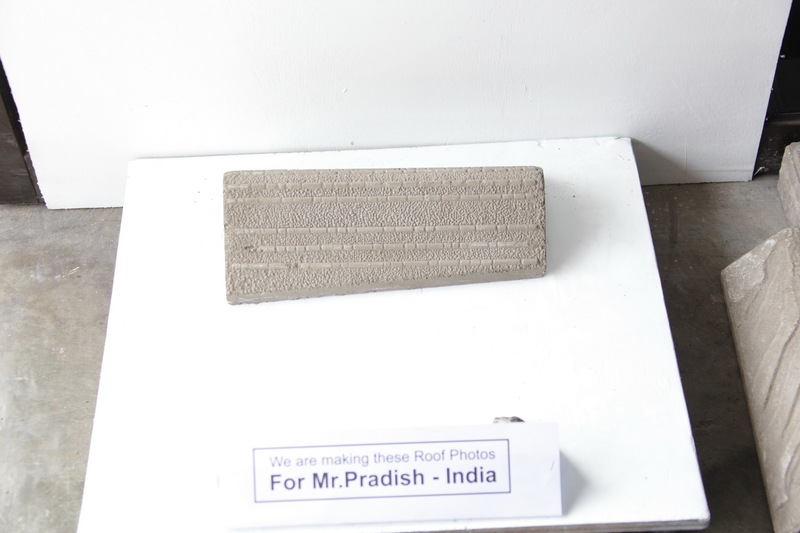 Now , we were ready to take the photos , and here are the result with explanation of each models , as Mr.Pradish asked me . 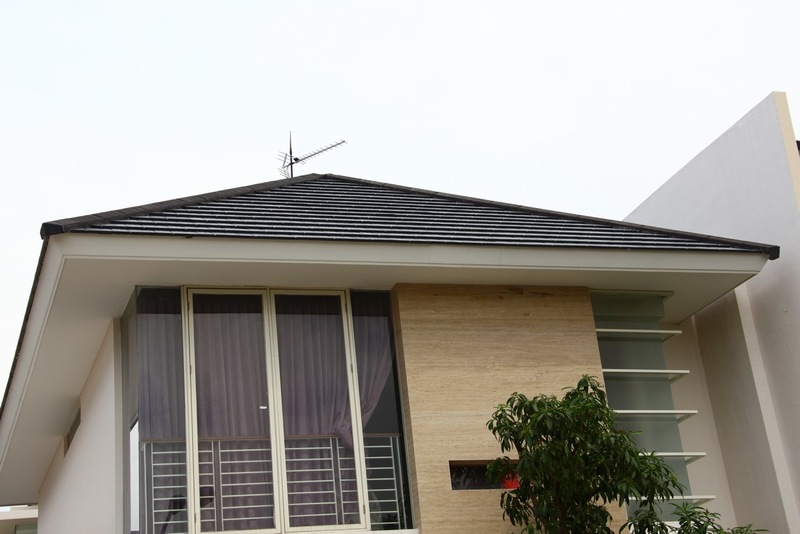 THEN , IN MID OF 2011 , A NEW DESIGN OF FLAT ROOF COME UP , THIS NEW DESIGN IS BECOMING POPULAR NOW , BECAUSE IT ALSO REDUCE THE LATHS USE . 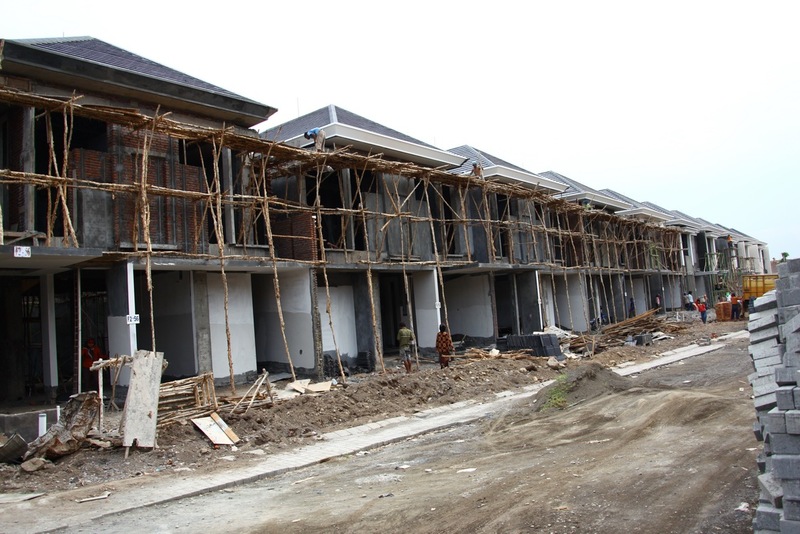 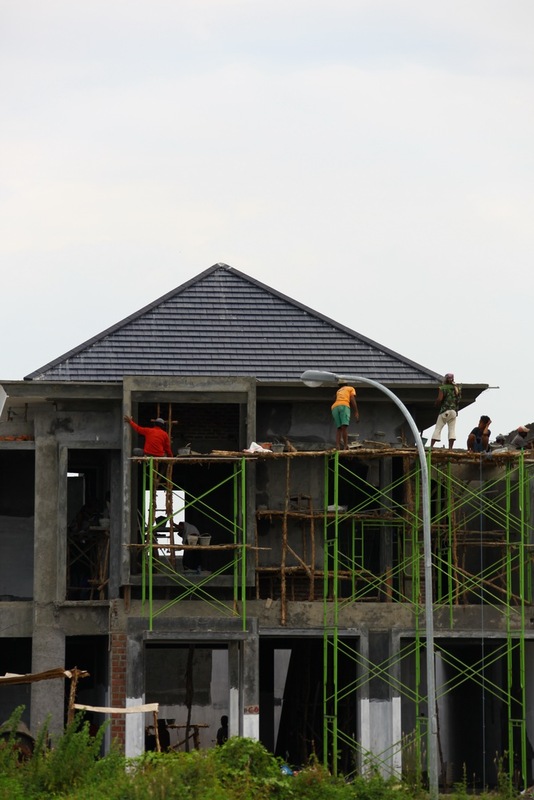 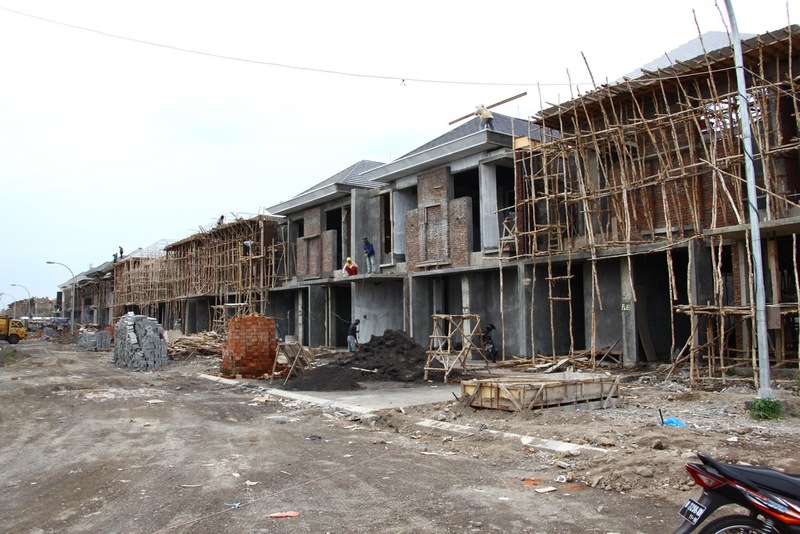 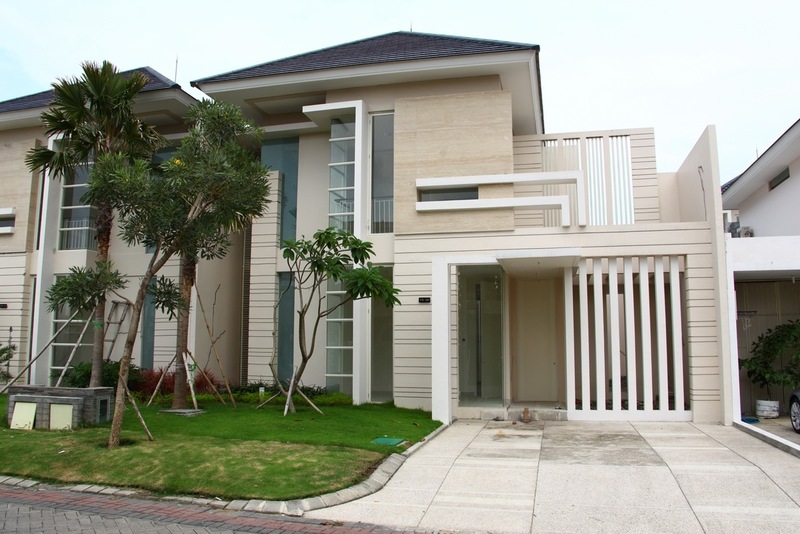 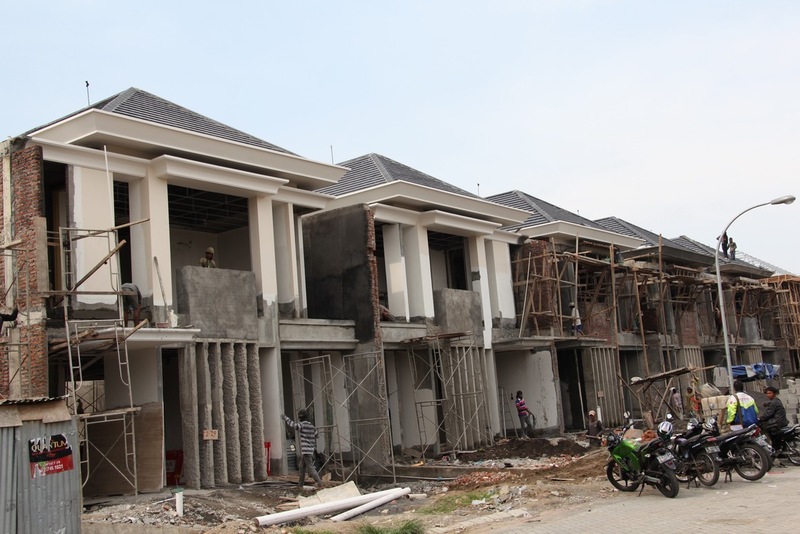 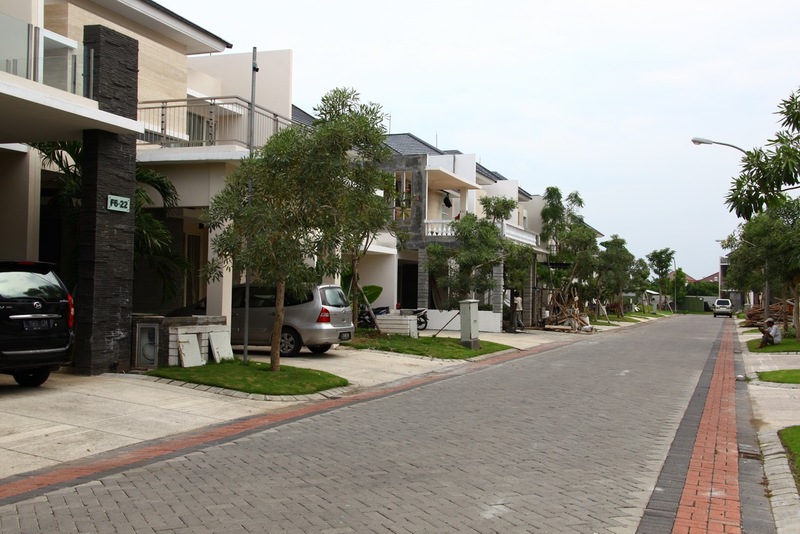 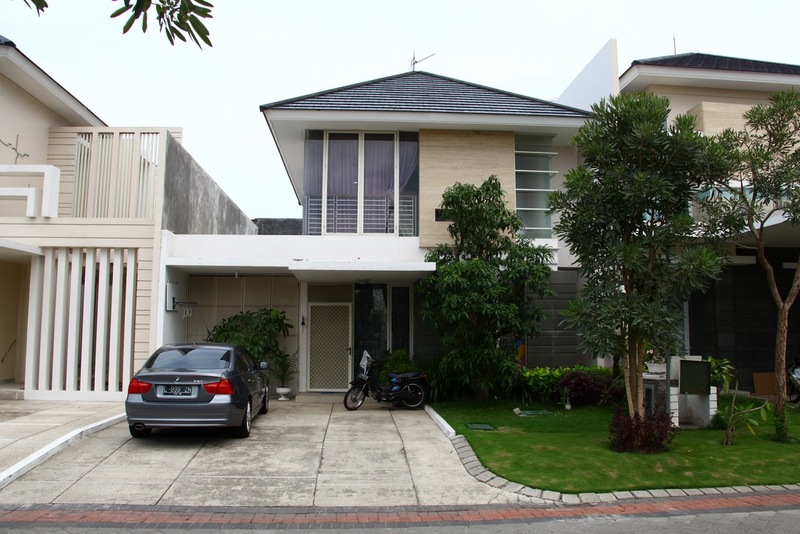 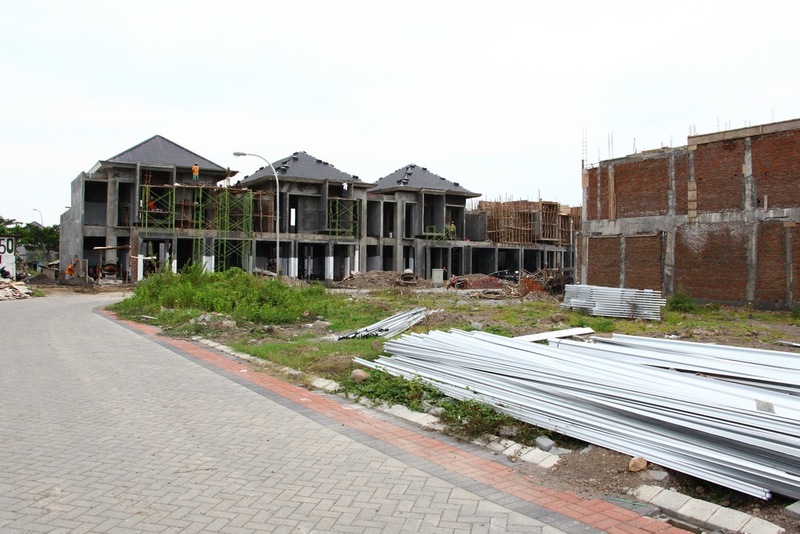 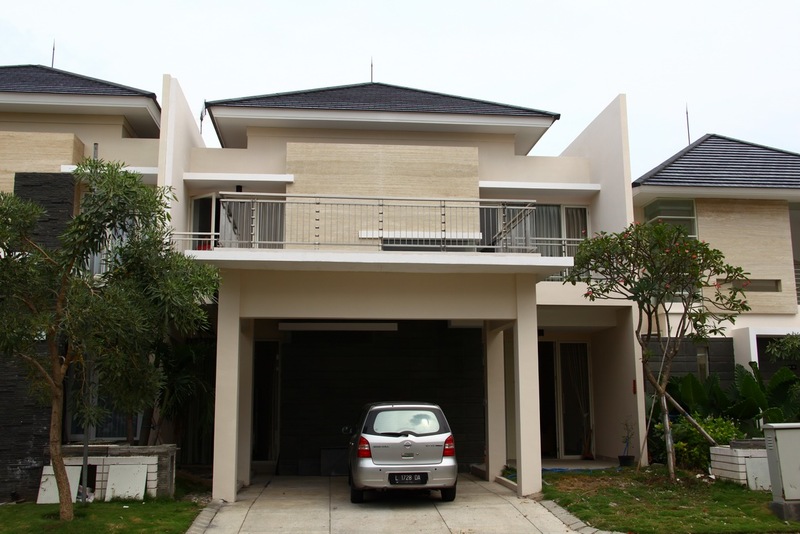 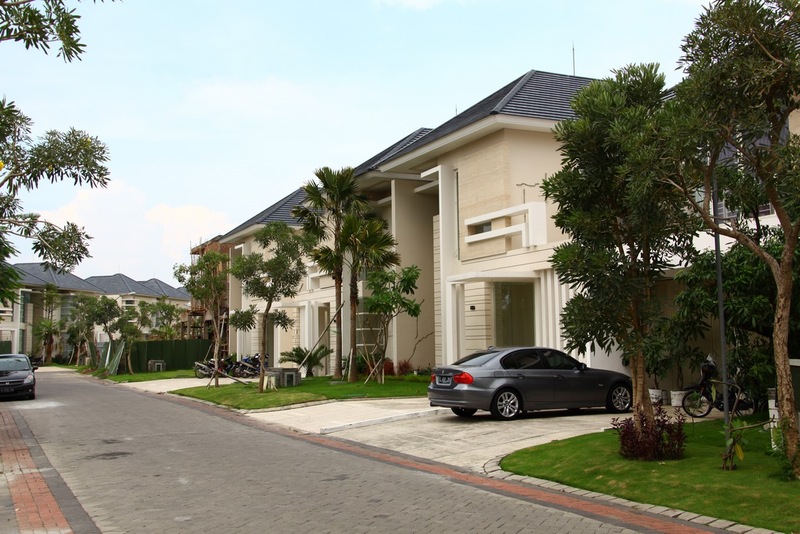 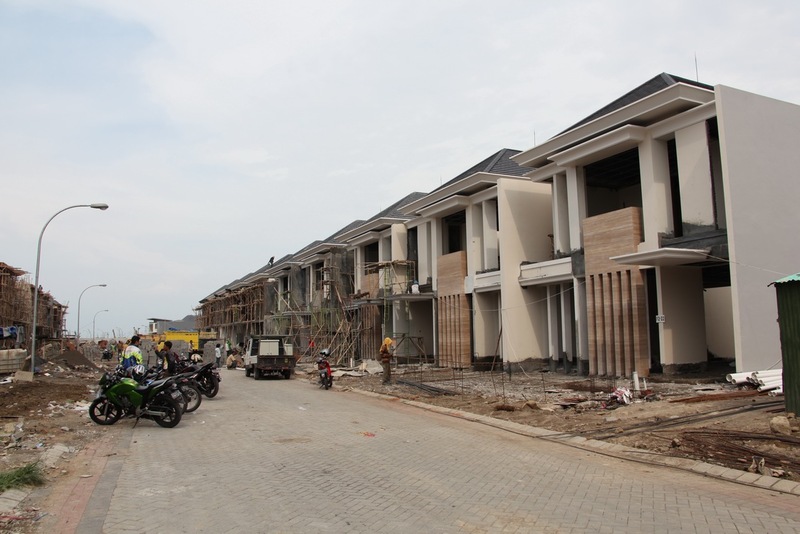 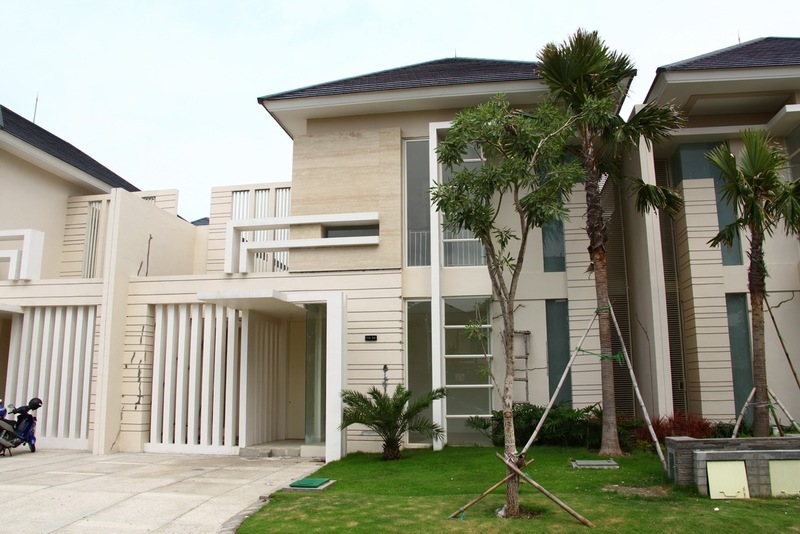 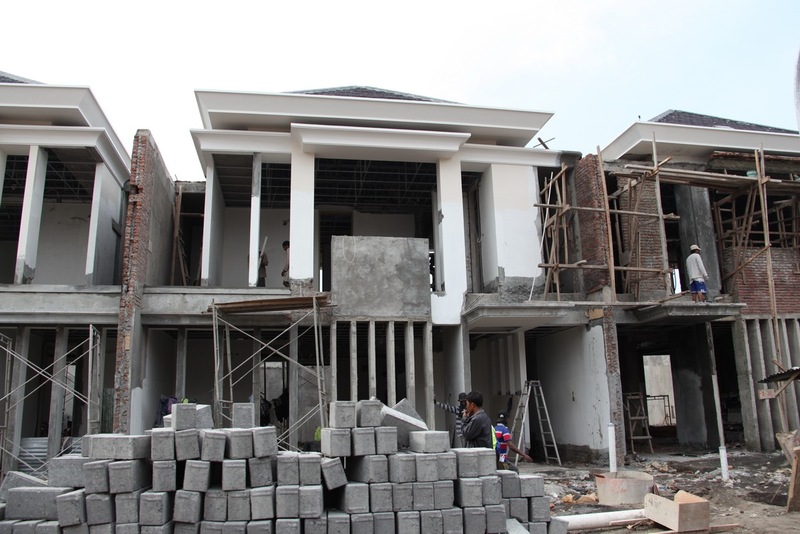 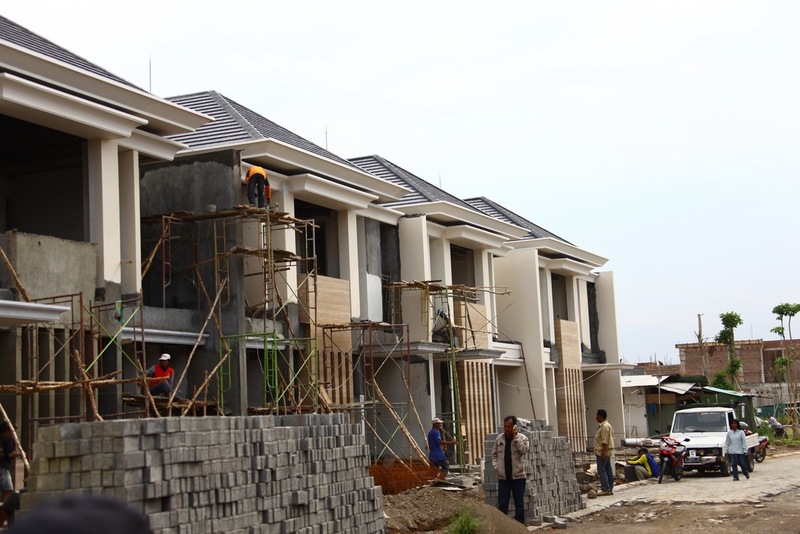 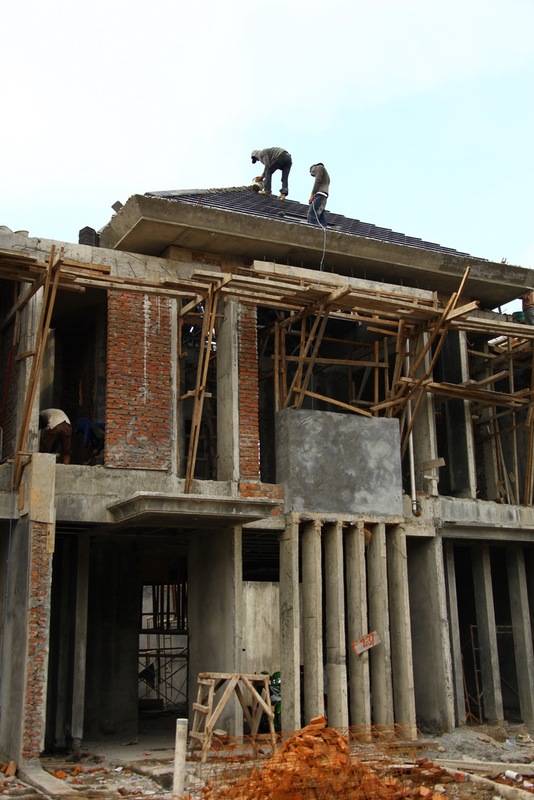 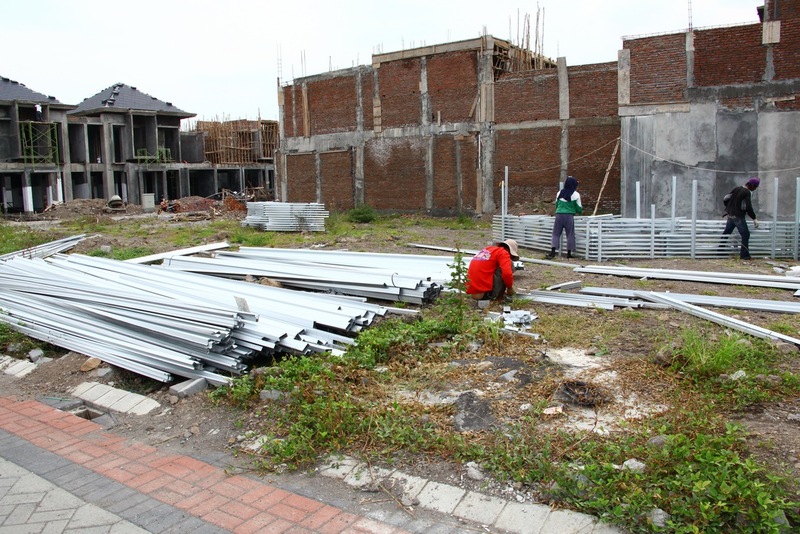 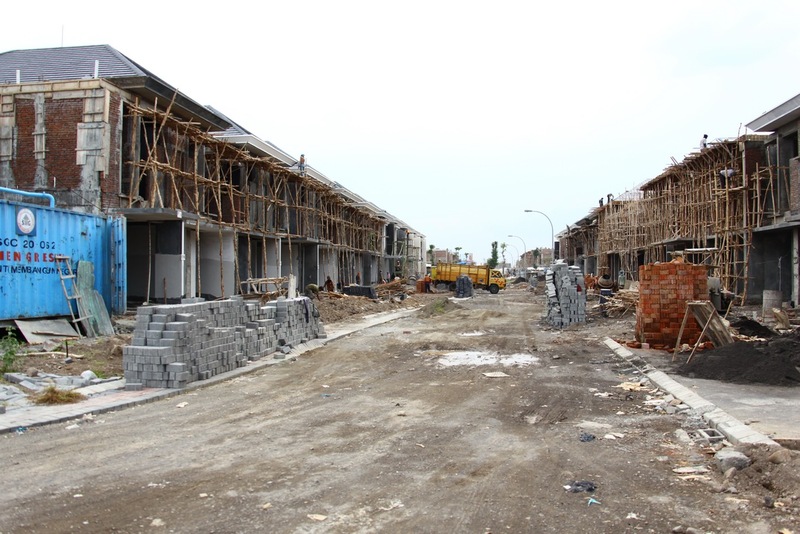 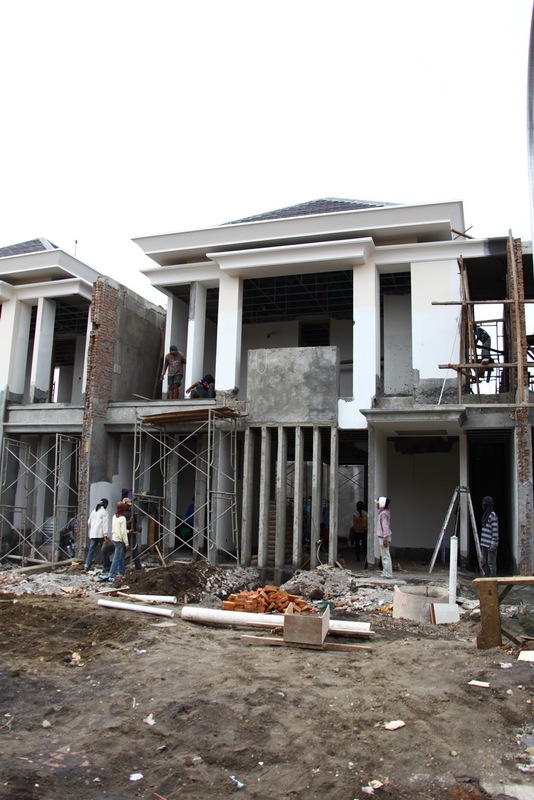 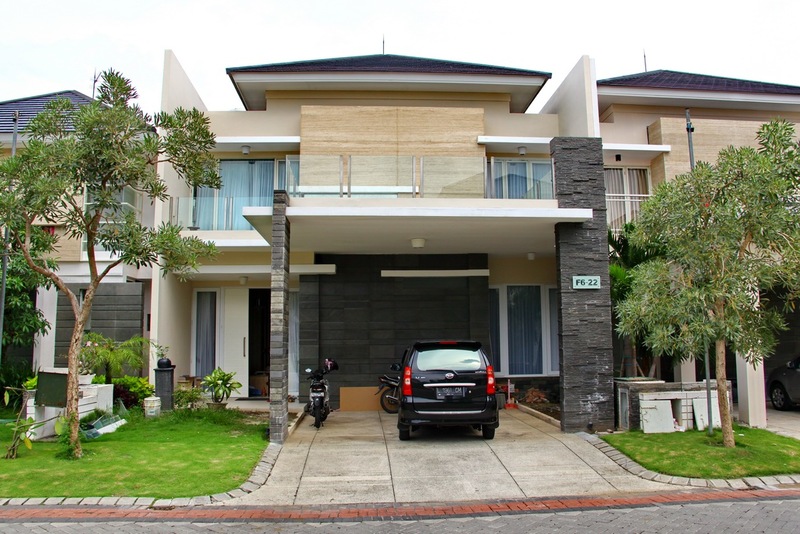 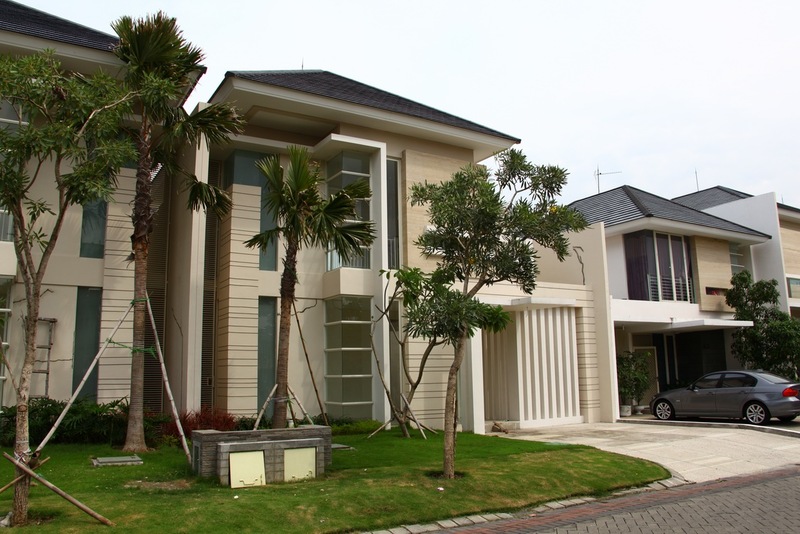 Pembangunan Rumah di Pakuwon City – Palm Beach ( Maret 2012 ) , Semua pakai genteng model Flat Multiline !